The present invention relates to coating agents comprising (A) at least one polyacrylate comprising hydroxyl groups and/or at least one polymethacrylate comprising hydroxyl groups, and (B) at least one compound (B) comprising isocyanate groups having at least one structural unit (I) of the formula (I) -NR-(X-SiR"x(OR')3-x) (I), and at least one structural unit (II) of the formula (II) -N(X-SiR"x(OR')3-x)n(X'-SiR"y(OR')3-y)m (II), characterized in that (i) the polyacrylate comprising hydroxyl groups and/or the polymethacrylate comprising hydroxyl groups comprise a glass transition temperature of less than 10 DEG C, (ii) the compound (B) comprising isocyanate groups comprises more than 10 to 90 mol % of at least one structural unit of the formula (I) and 10 to less than 90 mol % of at least one structural unit of the formula (II), each relative to the entirety of the structural units (I); and (II), and (iii) 10 to 60 mol % of the isocyanate groups of the di- and/or polyisocyanate base body of the compound (B), have been converted to the structural units of the formulas (I) and (II). The present invention further relates to a multistage coating method using said coating agent and to the use of the coating agent as a clear varnish, or to the use of the coating method for series painting of automobiles, painting of automobile accessories, and repair painting of automobiles. 本发明涉及基于质子惰性溶剂的可热固化的涂层剂，其含有含羟基的聚丙烯酸酯多元醇和/或含羟基的聚甲基丙烯酸酯多元醇和含硅烷基团的含异氰酸酯基团的化合物⑶。  The present invention relates to coating compositions based on aprotic solvents may be heat-curable, isocyanate-containing ester groups-containing polymethacrylate hydroxyl group-containing polyacrylate polyols and / or hydroxyl containing polyol containing silane groups compound ⑶.
 WO 2001/98393中描述了2K-涂层剂，该涂层剂含有作为粘结剂组分的多元醇以及作为交联剂组分的多异氰酸酯，该多异氰酸酯以低份额用烷氧基甲硅烷基胺，优选用双烷氧基甲硅烷基胺官能化。  In WO 2001/98393 describes a 2K- coating agent, the coating agent contains a polyol component as a binder and a polyisocyanate component as crosslinking agent, the polyisocyanate with a low share alkoxy silyl amines, preferably with bis alkoxysilyl amine functional group. 这样的涂层剂尤其作为打底漆使用，且优化了在金属基底上，优选在铝基底上的粘附性。 Such a coating agent, especially as the primer used and optimized on the metal substrate, preferably aluminum adhesion on the substrate. 在所产生的涂层的良好的埃氏杯突以及良好的抗石击性能的同时的耐刮擦性方面，这样的涂层剂没有得到优化，并且也没有找到如何可以控制所产生的涂层的这些性质的说明。 In the scratch resistance while Erichsen good and good anti-chip coating properties of the generated aspect, this coating agent has not been optimized, and also can not find how to control the resulting coating the description of these properties. US-A-2006/217472描述了含有含羟基的聚丙烯酸酯多元醇和/或含羟基的聚甲基丙烯酸酯多元醇，低分子量多元醇组分，多异氰酸酯以及氨基官能的烷氧基甲硅烷基组分，优选双烷氧基甲硅烷基胺的涂层剂。  US-A-2006/217472 describes a polymethacrylate polyol contains hydroxyl-containing polyacrylate polyols and / or hydroxyl containing, low molecular weight polyol component, a polyisocyanate and an amino-functional alkoxy silyl group component, preferably bis alkoxysilyl amine coating agent. 尽管这种所描述的体系显示出耐刮擦的性质，然而使用升高份额的双烷氧基甲硅烷胺大多导致耐候性弱的体系。  Although such systems described exhibit scratch resistant properties, however use of elevated share alkoxysilyl amine bis mostly result in weak weather system. 此外，所述的丙烯酸酯具有相对高的苯乙烯含量和高份额的甲基丙烯酸酯，这可能显示出在埃氏杯突下低的值。 Further methacrylate, said acrylate having a relatively high styrene content and high share, it may exhibit low values ​​at Erichsen. EP-I 273 640中描述了由多元醇组分和交联组分组成的2K-涂层剂，所述交联组分由其中部分异氰酸酯基团与双烷氧基甲硅烷基胺反应的多异氰酸酯组成。  EP-I 273 640 describes a 2K- coating agent a polyol component and a crosslinking component composition, wherein said crosslinking component by a portion of the isocyanate groups and alkoxy silyl bis amine the reaction of the polyisocyanate composition. 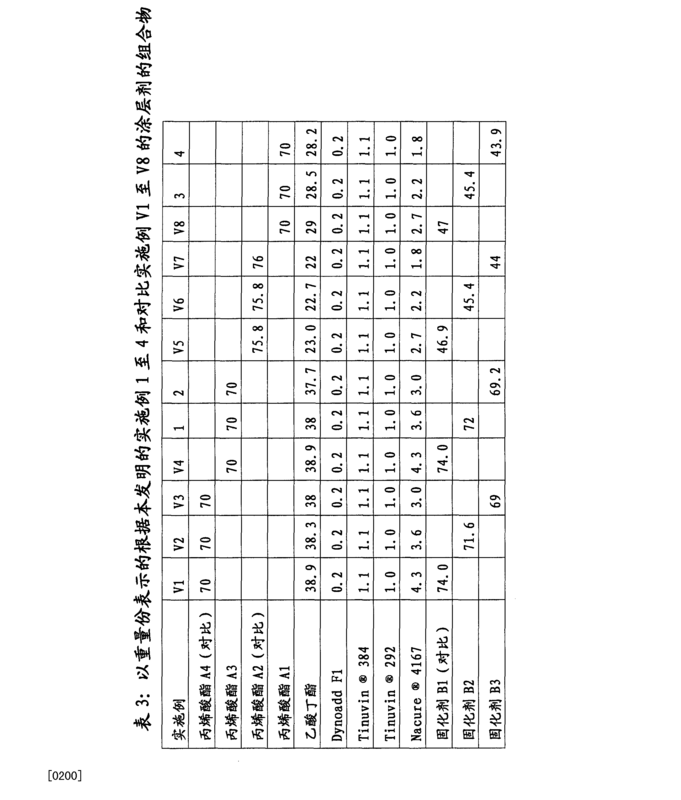 根据该文献，合适的是所有具有多于两个羟基的多元醇。 According to this document, all suitable polyols having more than two hydroxyl groups. 除聚酯多元醇、聚碳酸酯多元醇、聚醚多元醇以及含氨基甲酸酯基团和含酯基团的多元醇以外，还可以使用聚丙烯酸酯多元醇或者聚甲基丙烯酸酯多元醇。 In addition to the polyester polyols, polycarbonate polyols, polyether polyols and containing urethane groups and a polyol containing ester groups may also be used a polyol polyacrylate or polymethacrylate polyols . 然而，在该文献中没有详说明，所选择的粘结剂对所得到的涂层的性质具有何种影响。 However, no detailed description in this document, which affect the choice of a binder having properties of the resulting coating. 这样的涂层剂可以用于汽车系列涂漆，并具有良好的耐刮擦性，同时对环境影响具有良好的耐性。  Such coating agents may be used in automotive OEM finishing, and has good scratch resistance, while having good resistance to environment in. 然而，所得到的涂层的埃氏杯突越低，则所得到的涂层的耐刮擦性越好。 However, the lower the resulting Erichsen coatings, scratch resistant coating is obtained, the better. 然而，如何能够获得具有良好耐刮擦性，但同时具有至少足够的埃氏杯突，且没有显著地削弱抗石击性能的涂层没有在该文献中并未说明，同样没有就所谓的长期耐刮擦性，也就是说在反复刮擦负荷时的耐刮擦性做出说明。 However, how can be obtained having good scratch resistance, but has at least a sufficient Erichsen, and not significantly impair the performance of the anti-chip coating is not described in this document is not, it is not the same so-called long-term scratch resistance, i.e. make a note in the scratch resistance in repeated scratch load. 由WO 08/7449UW0 08/74490和WO 08/74489已知2K-涂层剂，其含有多元醇，诸如聚酯多元醇、聚氨酯多元醇、聚硅氧烷多元醇，优选含羟基的聚丙烯酸酯多元醇和/或含羟基的聚甲基丙烯酸酯多元醇；和其中部分异氰酸酯基团与由单烷氧基甲硅烷基胺和双烷氧基甲硅烷基胺组成的混合物反应的多异氰酸酯。  From WO 08 / 7449UW0 08/74490 and WO 08/74489 are known 2K- coating agent containing a polyol, such as polyester polyols, polyurethane polyols, polysiloxane polyols, the hydroxyl group-containing polyacrylate polyols and / or hydroxyl group-containing polymethacrylate esters of polyhydric alcohols; and wherein the polyisocyanate mixture is reacted portion of the isocyanate groups of a single alkoxysilyl amine and bis alkoxysilyl amine composition . 这种涂层剂既具有良好的耐刮擦性，又具有良好的耐候性。 The coating agent not only has excellent scratch resistance, but also has good weather resistance. 不过，为了达到非常高的耐刮擦性，需要涂层剂的硅烷含量相对高。 However, in order to achieve very high scratch resistance, the content of the silane coating agent needs to be relatively high. 因此，值得期望的是，即使在硅烷含量较低的情况下达到非常高的耐刮擦性或者在相同的剩余硅烷含量的情况下进一步改进耐刮擦性。 Accordingly, it is desirable, even very high to achieve scratch resistance at lower levels of silane to further improve the situation or scratch resistance in the same case of the remaining silane content. 但是在这种情况下，涂层的其它性质，尤其是良好的抗石击性能和埃氏杯突不应当被削弱或者不应当被显著地削弱。 However, in this case, other properties of the coating, in particular good performance and anti-chip Erichsen should not or should not be impaired significantly weakened. 由尚未公开的专利申请DE 10 2007 O 61 855. 9_43同样已知涂层剂，其含有至少ー种含羟基的化合物（A)，至少ー种含异氰酸酯基团的化合物（B)和至少ー种含磷的催化剂，其中涂层剂的ー种或多种成分，优选含异氰酸酯基团的化合物具有基于羟基、异氰酸酯基团和可水解硅烷基团之和计，2. 5至97. 5mol%的量的可水解硅烷基团。  Not disclosed in the patent application DE 10 2007 O 61 855. 9_43 coating compositions is also known, which contains at least a hydroxyl group-containing compound (A) ー species, at least one compound containing isocyanate groups ー species (B) and at least ー phosphorus containing catalyst, wherein ー seed coating agent or more components, preferably a compound containing isocyanate groups having on hydroxyl group, an isocyanate group and a hydrolyzable and count silane groups of, from 2.5 to 97. 5mol% of the amount of hydrolyzable silane groups. 作为对该发明而言的重要成分，这种涂层剂含有作为另外的催化剂的至少ー种双环胺。 As an important component for the purposes of the invention, the coating composition comprises at least species ー bicyclic amines as an additional catalyst. 作为含羟基的化合物，使用聚酯多元醇、聚氨酯多元醇、聚硅氧烷多元醇，优选含羟基的聚丙烯酸酯多元醇和/或聚甲基丙烯酸酯多元醇。 As the hydroxyl group-containing compounds, polyester polyols, polyurethane polyols, polysiloxane polyols, hydroxyl group-containing polyacrylate polyols and / or polymethacrylate polyols. 然而，在该文献中没有说明，可以如何通过合适地选择粘结剂进ー步改进涂层剂的耐刮擦性。 However, not described in this document, it may be how by suitably selecting a binder into the coating agent ー further improve scratch resistance. 尚未公开的专利申请DE 10 2008 060454. 2_43描述了涂层剂，其含有至少ー种含羟基的化合物、至少ー种具有可水解硅烷基团的含异氰酸酯基团的化合物和至少ー种含磷的催化剂。  Not published patent application DE 10 2008 060454. 2_43 described coating agent containing at least hydroxyl-containing compound ー, at least ー compounds having a hydrolyzable silane group-containing isocyanate groups and at least ー species phosphorus-containing catalyst. 在此，对于改进视觉印象对该发明而言重要的是，使用特别的聚酯作为含羟基的化合物。 Here, for the improvement of the visual impression it is important in terms of the invention is used particularly as a hydroxyl-containing polyester compound. 此外由EP-B-692 007已知涂层剂，其含有作为粘结剂的基于丙烯酸4-羟丁酯或者甲基丙烯酸4-羟丁酯的含羟基的聚丙烯酸酯和作为交联剂的多异氰酸酷。  Moreover the EP-B-692 007 is known a coating agent containing as a binder based on hydroxyl-containing polyacrylate 4-hydroxybutyl acrylate or methacrylate and 4-hydroxybutyl acrylate as a cross polyisocyanate crosslinking agent cool. 所得到的涂层具有与到那时为止所使用的涂层剂相比改进的耐刮擦性和良好的耐酸性。 The resulting coating has improved scratch resistance and good acid resistance as compared with the coating agent used until then. 然而没有描述使用硅烷化的多异氰酸酷。 However, no description of the use of silanized polyisocyanates cool. 然而，所选择的粘结剂对所得到的涂层的性质具有怎样的影响，没有在该文献中说明，同样没有说明如何能够获得具有进ー步改进的耐刮擦性，同时具有良好的埃氏杯突和良好的抗石击性能的涂层。 However, the selected binder has what influence on the properties of the resulting coating, not described in this document does not indicate how the same can be obtained having a further improved intake ー scratch resistance, while having good Angstroms s cupping and good anti-chip coating performance. 最后由WO 07/016234已知涂层剂，尤其是清漆，其同时具有良好的耐刮擦性和良好的抗石击性能。  Finally, a coating agent known in WO 07/016234, especially a varnish, which also has good scratch resistance and good anti-chip performance. 这由此实现，相应的多层涂层在单次刮擦测定时，具有至少26mN的撕裂力和至少30mN/i!m的抗弹性变形性。 This is achieved, when the multilayer coating corresponding single scratch measurement, having a tear strength of at least 26mN and at least 30mN / i! Anti elastic deformability of m. 在该篇中使用的涂层剂含有硅烷改性的聚丙烯酸酯共聚物、超支化的聚酯以及多异氰酸酯和氨基树脂作为交联剂。 Coating agent used in the article containing silane-modified polyacrylate copolymers, hyperbranched polyester, and a polyisocyanate and an amino resin as a crosslinking agent. 但是，在该篇中被同样少地描述含有用烷氧基甲硅烷基胺改性的多异氰酸酯作为交联剂的涂层剂，也没有说明对所得至IJ的涂层的埃氏杯突的影响。 However, little is described in the same article containing polyisocyanate with alkoxysilyl group-modified amine as a coating agent, a crosslinking agent, there is no description of the resulting coating to IJ the Erichsen influences. 本发明的目的在于提供涂层剂，尤其是在汽车系列涂漆和汽车修补涂漆时用于清漆层的涂层剂，其产生具有非常好的耐刮擦性，而且还在长期耐刮擦性方面-即在反复的刮擦负荷之后-同时在埃氏杯突测试中具有良好結果，且同时具有良好抗石击性能的涂层。  The object of the present invention to provide a coating agent, a coating agent for a varnish layer especially in automotive OEM finishing and automotive refinish, which produces very good scratch resistance, but also long-term terms of scratch resistance - i.e., after repeated wiping load - at the same time with good results Erichsen test, while having good anti-chip coating properties. 尤其是该涂层应当具有如此高的耐刮擦性，使得残余光泽度（20°測量角）在所谓的耐摩擦牢度测试之后为至少40%，优选至少50%，而同时还达到大于7. Omm的良好的埃氏杯突值（来自至少6次测量的平均值）和良好的抗石击性能。 In particular, the coating should have such high scratch resistance, so that the residual gloss (20 ° measuring angle) after a so-called rubbing fastness test at least 40%, preferably at least 50%, while also amounts to more than 7 . Omm good Erichsen value (mean value from at least 6 measurements) and a good anti-chip performance. 此外，涂层，特别是清漆还应当能够即使以大于40 ym的层厚制备而不产生应力裂纹。 Furthermore, the coating, in particular, should be capable of even further varnish layer thickness of greater than 40 ym prepared without stress cracks. 此外，该涂层剂应当满足通常在汽车系列涂漆和汽车修补涂漆中对清漆层提出的要求。  In addition, the coating compositions should meet the requirements of the varnish layer is typically made in automotive OEM finishing and automotive refinish paint system. 最后，该新型涂层剂可以简单地且以可非常好地再现的方式制备，并且在漆的施涂时不造成生态学上的问题。 Finally, the novel coating composition can be simply and in a manner very well reproduced prepared, and does not cause ecological problems during paint application. (iii)使化合物⑶的ニ异氰酸酯和/或多异氰酸酯母体的10至60mol%的异氰酸酯基团反应生成式（I)和（II)的结构单元。  (iii) reacting a compound of ⑶ ni and isocyanate (II) carbonate structural units and / or 10 to 60mol% isocyanate precursor reaction of the isocyanate groups of formula (I). 此外，本发明的主题是使用这样的涂层剂的多步涂层方法以及所述涂层剂作为清漆的用途或者所述涂层方法用于汽车系列涂漆、汽车部件的涂漆和汽车修补涂漆的用途。  Furthermore, subject of the present invention is the use of such coating compositions and multi-step method of coating the coating agent for use as paint or the varnish coating process for automotive OEM finishing, automotive parts automotive refinish paint and use of. 鉴于现有技术，令人惊讶的和对本领域技术人员而言不可预见的是，本发明所基于的目的，可借助于根据本发明的涂层剂来实现。  In view of the prior art, and surprising to those skilled in the art not foreseeable that the object of the present invention is based, may be achieved by means of the coating composition of the present invention. 因此，尤其令人惊讶的是，根据本发明的涂层剂产生具有非常好的耐刮擦性，而且还在长期耐刮擦性方面，同时在埃氏杯突测试中具有良好結果，且同时具有良好抗石击性能的涂层。  Thus, in particular, surprising that, with very good scratch resistance, scratch resistance but also long-term aspect of the present invention to produce a coating agent while having good results Erichsen test , while having good coating properties stoning resistance. 尤其是该涂层具有如此高的耐刮擦性，残余光泽度（20°測量角）在所谓的耐摩擦牢度测试之后为至少40%，优选至少50%，而同时还达到大于7. Omm的良好的埃氏杯突值（来自至少6次测量的平均值）和良好的抗石击性能。 In particular, the coating layer having such a high scratch resistance, residual gloss (20 ° measuring angle) after a so-called rubbing fastness test at least 40%, preferably at least 50%, while also achieve greater than 7. Omm good Erichsen value (mean value from at least 6 measurements) and a good anti-chip performance. 同时，根据本发明的涂层剂提供新的涂层和涂漆，特别是清漆，其能够即使以大于40um的层厚制备也不产生应力裂纹。  Meanwhile, new paint coatings and the coating compositions of the present invention, especially a varnish, which can be prepared even if a layer thickness of not larger than 40um to stress cracks. 因此，根据本发明的涂层和涂漆，尤其是清漆，可以用于技术和美学上特别苛刻的汽车系列涂漆（OEM)领域。 Thus, according to the present invention, coatings and paint, especially a varnish, it may be used on technical and aesthetic particularly demanding automotive OEM finishing (OEM) field. 本发明的重点在干，涂层剂含有作为组分（A)的至少ー种含羟基的聚丙烯酸酯和/或至少ー种含羟基的聚甲基丙烯酸酷，所述聚丙烯酸酯和/或聚甲基丙烯酸酯具有低于10°c的玻璃化转变温度Tg。  The focus of the present invention when dry, the coating agent contains as component (A) is at least ー species polyacrylates containing hydroxyl and / or hydroxyl group-containing species at least ー polymethacrylate cool, the polyacrylate and / or polymethacrylate having a 10 ° c lower than the glass transition temperature Tg. 作为组分（A)使用的含羟基的聚丙烯酸酯和/或作为组分（A)使用的含羟基的聚甲基丙烯酸酯优选地具有-60至5°C，特别优选-30至< 0°C的玻璃化转变温度Tg。 (A) used as component a hydroxyl-containing polyacrylate and / or polymethacrylate as component preferably hydroxyl group-containing (A) used having a -60 to 5 ° C, particularly preferably from -30 to <0 the glass transition temperature ° C. Tg. 玻璃化转变温度借助于DSC测量按照DIN-EN-ISO 11357-2測定。  The glass transition temperature was measured by means of DSC measurement according to DIN-EN-ISO 11357-2. Tgn =由第n种单体形成的均聚物的玻璃化转变温度。  Tgn = homopolymer has a glass transition temperature formed by the first n monomers. 令人惊讶的是，通过使用具有低于10°C的玻璃化转变温度Tg的含羟基的聚丙烯酸酷和/或含羟基的聚甲基丙烯酸酯，各自在具有相同硅烷含量的相同的固化剂份额（B)和相同比例的结构单元⑴和（II)的前提下，与使用具有相同OH-值、但具有> 10°C的更高的玻璃化转变温度Tg的相应聚（甲基）丙烯酸酯相比，可以明显改进所得到的涂层的耐刮擦性。  Surprisingly, by using a Tg containing minimum 10 ° C glass transition temperature of the cool hydroxyl polyacrylic acid and / or hydroxyl group-containing polymethacrylate each having the same content in the same silane share the premise of a curing agent (B) and the same proportion of the structural unit ⑴ and (II), and OH- and having the same value, but having a> 10 ° C higher glass transition temperature Tg of the corresponding poly (a yl) acrylate as compared can significantly improve the scratch resistance of the resulting coating. 同样令人惊讶的是，同时可以明显改进埃氏杯突值。 Equally surprising it is that at the same time can be significantly improved Erichsen value. 此外，相应地通过使用具有低于10°C的玻璃化转变温度的聚（甲基）丙烯酸酯多元醇（A)，与基于具有高于10°C的玻璃化转变温度的聚（甲基）丙烯酸酯多元醇的涂层剂相比，能够由更低的硅烷含量获得同样好的耐刮擦性，这从经济的角度来看也是吸引人的，因为氨基硅烷是这类漆料体系中成本最闻的成分。 Further, by using a correspondingly minimum 10 ° C glass transition temperature of the poly (meth) acrylate esters of polyols (A), and poly (meth) higher than 10 ° C having a glass transition temperature the coating agent as compared with acrylic polyol can be obtained by a silane content less equally good scratch resistance, from the economic point of view it is attractive because this type of coating system are aminosilane in cost the most audible component. 共聚，其中组分（a)、（b)、（c)、(d)、(e)和（f)的重量份之和始终为100重量％。  copolymer, wherein component (a), (b), (c), (d), (e) and (f) the sum of the parts by weight is always 100% by weight. 作为含羟基的丙烯酸的酯（a)，优选使用丙烯酸2-羟こ酯、丙烯酸2-羟丙酯、丙烯酸3-羟丙酯、丙烯酸3-羟丁酯和丙烯酸4-羟丁酯以及这样的单体的混合物。  The ester (a) hydroxyl-containing acrylate, 2-hydroxyethyl acrylate is preferably used ko acrylate, 2-hydroxypropyl acrylate, 3-hydroxypropyl acrylate, 3-hydroxybutyl acrylate and 4-hydroxybutyl acrylate and mixtures of such monomers. 作为含羟基的甲基丙烯酸的酯（b)，优选使用甲基丙烯酸2-羟こ酷、甲基丙烯酸2-羟丙酷、甲基丙烯酸3-羟丙酷、甲基丙烯酸3-羟丁酯和甲基丙烯酸4-羟丁酯以及这样的单体的混合物。  The ester (b) hydroxyl group-containing methacrylic acid, 2-hydroxyethyl methacrylate is preferably used ko cool, cool methacrylate, 2-hydroxypropyl, 3-hydroxypropyl methacrylate, cool propyl methacrylate, 3- hydroxybutyl acrylate and 4-hydroxybutyl methacrylate, and mixtures of such monomers. 作为用于聚（甲基）丙烯酸酯多元醇的另外的单体组成部分（C)，优选使用在烷基残基中具有至少4个C原子的丙烯酸烷基酯和/或甲基丙烯酸烷基酷，诸如优选丙烯酸丁酷、甲基丙烯酸丁酷、丙烯酸异丁酷、甲基丙烯酸异丁酷、丙烯酸叔丁酷、甲基丙烯酸叔丁酷、丙烯酸戊酷、甲基丙烯酸戊酷、丙烯酸己酷、甲基丙烯酸己酷、丙烯酸こ基己酷、甲基丙烯酸こ基己酷、丙烯酸3，3，5-三甲基己酷、甲基丙烯酸3，3，5-三甲基己酷、丙烯酸十八酷、甲基丙烯酸十八酷、丙烯酸月桂酯或甲基丙烯酸月桂酷；丙烯酸环烷基酯和/或甲基丙烯酸环烷基酷，诸如丙烯酸环戊酷、甲基丙烯酸环戊酷、丙烯酸异冰片酯、甲基丙烯酸异冰片酷、丙烯酸环己酯和/或甲基丙烯酸环己酷。  As for the poly (meth) additional monomer component of the acrylic polyol (C), is preferably used in the alkyl residue in alkyl acrylate at least 4 C atoms and / or methyl having cool alkyl acrylate, preferably acrylic acid such as butyl cool, cool butyl methacrylate, isobutyl acrylate, cool, cool isobutyl methacrylate, t-butyl acrylate, cool, cool methacrylate, t-butyl, amyl acrylate, cool, cool pentyl methacrylate, , cool hexyl acrylate, hexyl methacrylate, cool, hexyl acrylate ko cool, hexyl methacrylate, ko cool, cool hexyl acrylate, 3,3,5-trimethyl, 3,3,5-trimethyl methacrylate hexyl cool, cool acrylate, stearyl methacrylate, eighteen cool, lauryl acrylate or lauryl methacrylate cool; cycloalkyl esters of acrylic and / or methacrylic acid cycloalkyl cool, cool such as cyclopentyl acrylate, methacrylate, cool cyclopentyl, isobornyl methacrylate, isobornyl cool, cyclohexyl acrylate and / or methacrylate, cyclohexyl cool. 作为单体（c)，优选使用丙烯酸丁酷、甲基丙烯酸丁酷、丙烯酸己酷、甲基丙烯酸己酷、丙烯酸こ基己酯和甲基丙烯酸こ基己酷。 The monomer (C), butyl acrylate is preferably used cool, cool butyl methacrylate, hexyl acrylate, cool, cool methacrylate, hexyl acrylate, hexyl group ko ko methacrylate and hexyl cool. 作为组分（e)，尤其使用苯こ烯和作为组分（d)尤其使用丙烯酸。  As component (e), and in particular benzene ko alkenyl as component (d) acrylic acid in particular. 作为组分（f)尤其可以使用另外的烯属不饱和羧酸的烷基酯和羟烷基酷。 In particular the use of additional ethylenically unsaturated carboxylic acid alkyl ester and hydroxyalkyl groups cool as the component (f). 根据本发明所使用的聚（甲基）丙烯酸酯多元醇（A)优选具有介于1，000和20，000道尔顿之间，尤其是介于1，500和10，000道尔顿之间的重均分子量，各自借助凝胶滲透色谱（GPC)相对于聚苯こ烯标样測定。  having of between 000 and 20,000 daltons used according to the present invention is a poly (meth) acrylate, polyol (A) preferably, especially between 1,500 and 10,000 channels the average molecular weight of between Hamilton, each by means of gel permeation chromatography (GPC) relative to polystyrene standard measured alkenyl ko. 聚（甲基）丙烯酸酯多元醇（A)优选具有60至300K0H/g，尤其是介于100和250mgKOH/g之间，非常特别优选介于150和200mgK0H/g之间的OH-值。  Poly (meth) acrylate, polyol (A) preferably has 60 to 300K0H / g, especially between 100 and 250mgKOH / g, very particularly preferably between between 150 and OH- 200mgK0H / g value. 羟值（0H-值）表示Ig物质在こ酰化时所连接的こ酸量相等当量的氢氧化钾的mg数。 Hydroxyl value (0H-value) is equal to the number of mg of potassium hydroxide equivalent amount of an acid substance while ko ko Ig acylation connected. 将样品在测定时用こ酸酐-吡啶煮沸并用氢氧化钾溶液滴定所产生的酸（DIN 53240-2)。 The samples were measured by ko anhydride - pyridine-boiling acid and (DIN 53240-2) with potassium hydroxide solution is titrated. 聚（甲基）丙烯酸酯多元醇（A)优选具有介于0和30mg KOH/g之间的酸值。  Poly (meth) acrylate, polyol (A) preferably has an acid value of between 0 and 30mg KOH / g. 在这里，酸值表示用于中和Ig组分（b)的各个化合物所消耗的氢氧化钾的mg数（DIN EN ISO2114)。 Here, the acid value indicates the number of mg of each compound used in the Ig and component (b) of consumed potassium hydroxide (DIN EN ISO2114). 作为组分（B)，根据本发明的涂层剂含有ー种或多种具有游离，即未封闭的和/或封闭的异氰酸酯基团的化合物。  as component (B), the coating compositions of the present invention is a compound having a free ー or more, i.e., unblocked and / or blocked isocyanate group-containing. 根据本发明的涂层剂优选含有具有游离异氰酸酯基团的化合物（B)。 The coating agent of the present invention compound (B) having a free isocyanate group-containing. 但是，含异氰酸酯基团的化合物B的游离异氰酸酯基团也可以以封闭的形式使用。 However, the free isocyanate group-containing compound B is an isocyanate group may also be used in a closed form. 这在当根据本发明的涂层剂作为单组分体系使用时的情况下是优选的。 This is preferable in the case when the coating composition of the present invention as the case of using a single component system. 充当用于根据本发明优选使用的含异氰酸酯基团的化合物（B)的母体的ニ异氰酸酯和/或多异氰酸酯是本身已知的取代或未取代的芳族、脂族、环脂族和/或杂环多异氰酸酷。  serves as Ni isocyanate precursor and / or polyisocyanates are known per se, a substituted or unsubstituted aromatic, aliphatic, cycloaliphatic The compound (B) containing isocyanate groups is preferably used in the invention is and / or heterocyclic polyisocyanates cool. 优选的异氰酸酯的实例是：2，4_甲苯ニ异氰酸酷、2，6_甲苯ニ异氰酸酯、ニ苯甲烷-4，4' - ニ异氰酸酷、ニ苯甲烷-2，4' - ニ异氰酸酷、对苯ニ异氰酸酷、联苯ニ异氰酸酷、3，3' - ニ甲基-4，4' - ニ苯基ニ异氰酸酷、四亚甲基-1，4_ ニ异氰酸酷、六亚甲基-1，6_ ニ异氰酸酷、2，2，4_三甲基己烷-1，6-ニ异氰酸酷、异佛尔酮ニ异氰酸酯、亚こ基ニ异氰酸酷、1，12-十二烷ニ异氰酸酷、环丁烷-1，3- ニ异氰酸酷、环己烷-1，3- ニ异氰酸酷、环己烷-1，4- ニ异氰酸酷、甲基环己基ニ异氰酸酷、六氢甲苯-2，4- ニ异氰酸酷、六氢甲苯_2，6- ニ异氰酸酯、六氢亚苯基-1，3- ニ异氰酸酯、六氢亚苯基-1,4- ニ异氰酸酯、全氢化ニ苯基甲烷_2，4' - ニ异氰酸酷、4，4'-亚甲基ニ环己基ニ异氰酸酯（例如Fa. Bayer AG的Desmodur ®W)、四甲基ニ甲苯基ニ异氰酸酯（例如Fa. American Cyanamid的TMXDI Examples of preferred isocyanates are: toluene Ni isocyanate cool 2,4_, 2,6_ toluene diisocyanate ni, ni benzene-4,4 '- isocyanato cool ni, ni phenyl methane-2,4' - ni cool isocyanate, p-phenylene isocyanate cool ni, ni isocyanate cool biphenyl, 3,3 '- ni-4,4' - ni ni phenyl isocyanate cool, tetramethylene - 1,4_ cool ni isocyanate, hexamethylene isocyanate cool -1,6_ ni, ni 2,2,4_-trimethyl-1,6-isocyanate cool, isophorone ni isocyanates, alkylene group ni ko cool isocyanate, 1,12-Ni cool isocyanate, cyclobutane-1,3-isocyanato cool ni, ni isocyanatomethyl cyclohexane-1,3- cool, cool isocyanatomethyl cyclohexane-1,4-Ni, Ni-methylcyclohexyl isocyanate cool, hexahydro-toluene-2,4-Ni cool isocyanate, hexahydro-toluene diisocyanate _2,6- ni , Ni hexahydro-1,3-phenylene diisocyanate, hexahydro-1,4-phenylene diisocyanate ni, ni perhydro diphenylmethane _2,4 '- ni cool isocyanate, 4,4'- cyclohexylene-methylene ni ni isocyanate (e.g., Fa. Bayer AG of Desmodur ®W), tetramethyl ni ni tolyl isocyanate (e.g. Fa. American Cyanamid of TMXDI ®)和上述多异氰酸酯的混合物。 ®) and mixtures of the aforementioned polyisocyanates. 进ー步优选的多异氰酸酯是上述ニ异氰酸酯的缩ニ脲ニ聚体和异氰脲酸酯三聚体。 Into ー further preferred polyisocyanates are the above isocyanates condensing ni ni ni mer urea and isocyanurate trimers. 特别优选的ニ异氰酸酯母体和多异氰酸酯母体是具有小于等于0°C，优选-100°C至_20°C的玻璃化转变温度的ニ异氰酸酯和/或多异氰酸酷。  Particularly preferred ni isocyanate precursor and the polyisocyanate precursor is less than equal to 0 ° C, preferably -100 ° C to Ni isocyanate glass _20 ° C transition temperature and / or polyisocyanates cool. 玻璃化转变温度在这里借助于DSC-测量按照DIN-EN-ISO 11357-2測定。 The glass transition temperature was measured here by means 11357-2 DSC- measured according to DIN-EN-ISO. 非常特别优选的ニ异氰酸酯母体和多异氰酸酷母体是六亚甲基-1，6- ニ异氰酸酯和/或其异氰脲酸酯三聚体和/或脲基甲酸酯ニ聚体。 Very particularly preferred ni isocyanates and polyisocyanates cool parent precursor is 1,6-hexamethylene diisocyanate Ni and / or isocyanurate trimers and / or allophanate Ni-mer. 在另一本发明的实施方式中，多异氰酸酯是具有氨基甲酸酯结构単元的多异氰酸酯预聚物，其通过将多元醇与化学计量过量的上述多异氰酸酯反应而获得。  In another embodiment of the present invention, the polyisocyanate is a polyisocyanate prepolymer having a urethane structure radiolabeling element, which is obtained by a polyol with a stoichiometric excess of the polyisocyanate reaction. 这样的多异氰酸酯预聚物例如描述于US-A-4，598，131中。 Such polyisocyanate prepolymers described, for example in US-A-4,598,131. 各优选的烷氧基（OR')可以是相同的或不同的，然而对于基团的结构决定性的是它们何种程度上影响可水解硅烷基团的活性。  Preferred alkoxy groups in each (OR ') may be the same or different, but the structure of the group is decisive influence hydrolyzable reactive silane groups of the extent thereof. R'优选是烷基，尤其是具有I至6个C-原子的烷基。 R 'is preferably an alkyl group, particularly an alkyl group having I to 6 C- atoms. 特别优选的是提高硅烷基团的活性的基团R'，即好的离去基团。 Particularly preferred is a group R activity to improve silane groups', i.e. good leaving group. 就这方面而言，甲氧基基团比こ氧基基团更优选，且它们比丙氧基基团更有选。 In this regard, a methoxy group is more preferred than ko radicals, and they are selected from more than propoxy groups. 因此，特别优选的是R'=こ基和/或甲基，尤其是甲基。 Accordingly, particularly it preferred R '= ko group and / or methyl, especially methyl. 此外，有机官能化硅烷的活性还可以通过介于硅烷官能团和有机官能基团（用于与改性的成分反应）之间的间隔基x、x'的长度显著地受到影响。  In addition, the active organofunctional silane may also be a spacer between the x (for reaction with the modifying component), the length of x 'is significantly affected by the interposed silane functionality and an organic functional group. 对此示例性的是所谓的“ a ”硅烷，其可购自Wacker公司，并且在所述硅烷中在介于Si原子和官能团之间是亚甲基，而不是在“ Y ”硅烷的情况下存在的亚丙基。 Exemplary of this is the so-called "a" of the silane, which is commercially available from the company Wacker, and the silane is a methylene group interposed in between the Si atom and the functional group, and not in the case of "Y" silane the presence of propylene. 反应而获得，其中取代基具有上述含义。  The reaction is obtained, wherein the substituents have the above meanings. 根据本发明优选的化合物（IIa)是双（2-こ基三甲氧基甲硅烷基）胺、双（3-丙基三甲氧基甲硅烷基）胺、双（4-丁基三甲氧基甲硅烷基）胺、双（2-こ基三こ氧基甲硅烷基）胺、双（3-丙基ニこ氧基甲娃烧基）胺和/或双（4-丁基ニこ氧基甲娃烧基）胺。  Preferred compounds of the invention according to (IIa) is bis (2-ko trimethoxy silyl) amine, bis (3-trimethoxysilyl propyl) amine, bis (4-butyl-trimethoxyphenyl alkoxy silyl) amine, bis (2-yloxy ko ko trimethyl silyl) amine, bis (3-propyl group A baby burn Ni ko-yl) amine and / or bis (4-ni A burn-yl group Wa ko) amine. 非常特别优选的是双（3-丙基三甲氧基甲硅烷基）胺。 Very particularly preferred are bis (3-trimethoxysilyl propyl) amine. 这样的氨基硅烷例如以商品名：DEGUSSA公司的DYNASYLAN®或者OSI公司的Silquest®是可获得的。 Such aminosilane for example, trade name: DEGUSSA Company DYNASYLAN® or OSI's Silquest® are available. 根据本发明优选的化合物（Ia)是氣基烧基ニ烧氧基娃烧，优选诸如2_氣基こ基ニ甲氧基娃烧、2-氛基こ基ニこ氧基娃烧、3_氛基丙基ニ甲氧基娃烧、3_氛基丙基ニこ氧基硅烷、4-氨基丁基三甲氧基硅烷、4-氨基丁基三こ氧基硅烷。  Preferred compounds according to the present invention (Ia) is a gas-yl group ni burn burn burn baby group, preferably 2_ gas such as methoxy group ko ni baby burn group, a 2-group atmosphere ni ko ko-yl group Wa burning, 3_ atmosphere methoxy propyl ni baby burn, Ni ko 3_ atmosphere propyl trimethoxysilane, 4-aminobutyl trimethoxysilane, 4-aminobutyl three ko silane. 特别优选的化合物（Ia)是N-(2-( ニ甲氧基甲娃烧基）こ基）烧基胺、N_(3_( ニ甲氧基甲娃烧基）丙基）烧基胺、N-(4-( ニ甲氧基甲娃烧基）丁基）烧基胺、N- (2- ( ニこ氧基甲娃烧基）こ基）烧基胺、N-(3-( ニこ氧基甲娃烧基）丙基）烧基胺和/或N-(4-( ニこ氧基甲娃烧基）丁基）烧基胺。 Particularly preferred compounds (Ia) is N- (2- (methoxymethyl Ni Wa burn-yl) ko-yl) amine burning, N_ (3_ (Ni methoxymethyl baby burn-yl) propyl) amine burning, N- (4- (methoxymethyl Ni Wa burn-yl) butyl) amine burning, N- (2- (Ni ko group A baby burn-yl) ko-yl) amine burning, N- (3- ( ni ko group A baby burn-yl) propyl) amine burning and / or N- (4- (Ni ko group A baby burn-yl) butyl) amine burning. 非常特别优选的是N-(3-(三甲氧基甲硅烷基）丙基）丁胺。 Very particularly preferred are N- (3- (trimethoxysilyl) propyl) amine. 这样的氨基硅烷例如以商品名：DE⑶SSA公司的DYNASYLAN®或者OSI公司的Silquest®是可获得的。 Such aminosilane for example, trade name: DE⑶SSA DYNASYLAN® companies or company OSI Silquest® are available. 非常特别优选的含异氰酸酯基团的化合物（B)是六亚甲基-1，6_ ニ异氰酸酯和/或其异氰脲酸酯三聚体与双（3-丙基三甲氧基甲硅烷基）胺和N-(3-(三甲氧基甲硅烷基）丙基）丁胺的反应产物。  Very particularly preferred compounds (B) containing isocyanate groups are hexamethylene diisocyanate -1,6_ Ni and / or isocyanurate trimers with bis (3-trimethoxysilyl propyl silyl) amine and N- (3- (trimethoxy silyl) propyl reaction product) butylamine. 根据本发明使用的多异氰酸酯固化剂（B)的固含量有利地为至少50重量％，优选至少70重量％。  The polyisocyanate used in the present invention, the solid content of the ester curing agent (B) is advantageously at least 50 wt%, preferably at least 70 wt%. 本发明的重点在于，含异氰酸酯基团的化合物⑶具有大于10mol%至90mol%，优选20至8011101%,特别优选30至7011101%的至少ー种式⑴的结构单元⑴和10至小于90mol%,优选20至8011101%,特别优选30至7011101%的至少ー种式(II)的结构单元(II),各自基于结构単元（I)和（II)的总和计。  The focus of the present invention, the compound ⑶ containing isocyanate groups is greater than 10mol% to 90 mol% preferably from 20 to 8,011,101%, particularly preferably 30 to 7,011,101% of structural units ⑴ ー least of formula ⑴ and 10 to less than 90 mol% preferably from 20 to 8,011,101%, particularly preferably 30 to 7,011,101% of at least ー of formula (II), the structural unit (II), based on the structure of each element radiolabeling (I) and the sum of (II) is. 现令人惊讶地发现，尤其是式（I)的结构单元（I)比式（II)的结构单元（II)的比例对所得到的涂层的埃氏杯突结果具有完全决定性的影响。  It is now surprisingly found that proportion of the structural unit (I), especially of formula (I) ratio of formula (II), the structural unit (II) has completely decisive for Erichsen results obtained coating Impact. 在此，所得到的涂层的埃氏杯突随着单硅烷结构单元（I)増加的份额和双硅烷结构单元（II)降低的份额而増加。 In this case, the resulting coating Erichsen cup with lower projections monosilane structural units (I) to increase in the share of the bis-silane and structural unit (II) and to increase in the share. 多异氰酸酯母体的反应成结构单元（I)和（II)的异氰酸酯基团份额越高，则这种结构单元（I)/(II)的比例对埃氏杯突的影响在这种情况下通常就越大。 Polyisocyanate precursor reaction to structural units (I) the higher the isocyanate groups share and (II), the influence of the proportion of such a structural unit (I) / (II) of Erichsen typically in this case It will be. 即，硅烷化程度越高，也就是说，基于涂层剂的总固体计，反应成结构单元（I)加上（II)的异氰酸酯基团的份额越高，则这种结构単元⑴比结构单元（II)的比例对埃氏杯突的影响越大。 That is, the higher the degree of silylation, i.e., based on the total solids of the coating composition, the higher the share of the reaction of isocyanate groups to the structural units (I) plus (II), the ratio of this structural configuration radiolabeling membered ⑴ Erichsen greater the impact on the proportion of the unit (II) is. 这种影响当然仅在涂层剂的其它參数，例如组分（A)的玻璃化转变温度和单个组分的比例各自保持不变时适用。 Of course, this effect only in the proportion of other parameters of the coating agent, for example a glass component (A) and transition temperature of each individual component remains constant when applicable. 在这种情况下非常特别令人惊讶并且也非常有利的是，通过单硅烷结构単元（I)増加的份额和双硅烷结构单元（II)降低的份额改进埃氏杯突的同时，仅非常轻微地削弱所得到的涂层的耐刮擦性以及所得到的涂层的抗石击性能，然而，只要硅烷化程度既不太低也不太高，则基于涂层剂的总固体计，反应成结构单元（I)加上（II)的异氰酸酯基团的份额也既不太低也不太高。  In this case also very particularly surprising and very advantageous, by radiolabeling monosilane structural element (I) is reduced to increase in the share of the bis-silane and a structural unit (II) share the same time improving the Erichsen, anti-chip scratch resistance properties only very slightly weakened the resulting coating and the coating has, however, so long as the degree of silylation is neither too low nor too high, based on the total solids of the coating composition basis, reacted to an isocyanate group share structural units (I) plus (II) is neither too high nor too low. 同时在这种情况下，所得到的涂层的耐刮擦性通常随升高的硅烷化程度而增加，即基于涂层剂的总固体计，越高份额的反应成结构单元⑴和（II)的异氰酸酯基团，则耐刮擦性越高。  Also in this case, the scratch resistance of the resulting coating generally increased with the degree of silanization increases, i.e., the reaction to structural units ⑴ based on total solids of the coating composition, the higher the share and (II) is an isocyanate group, the higher the scratch resistance. 但令人惊讶地，根据本发明通过使用具有低于10°c的玻璃化转变温度的含羟基的聚（甲基）丙烯酸酯即使在相对低的结构单元（I)和（II)的份额的情况下，也就是相对低的硅烷化程度的情况下，也同样可以实现高耐刮擦性。 (Meth) acrylate even at relatively low structural unit (I) and the share of poly (II), but surprisingly, the present invention has a glass transition temperature comprising less than 10 ° c by using a hydroxyl group case, i.e. a case where a relatively low degree of silane, also possible to realize high scratch resistance. 由此根据本发明达到提供涂层剂的目的，所述涂层剂产生具有高耐刮擦性和同时高埃氏杯突值和良好的防石击的涂层。 The object of the present invention achieves thereby providing a coating agent, the coating agent to produce a coating having a high scratch resistance and simultaneously a high Erichsen value and good anti-stoning. (II)的份额非常低，且同时优选组分（A)的玻璃化转变温度尽可能低时，也获得高的所得涂层的埃氏杯突值。 (II) share very low, preferably while the glass component (A) transition temperature as low as possible, and the resultant coating layer to obtain a high Erichsen value. 各自基于涂层剂的固含量计,具有I. 5质量％至6. 0质量％ Si的计算的娃含量，优选2. 0质量％至5. 0质量％ Si的计算的硅含量的根据本发明的涂层剂是特别优选的。  each based on the solids content of the coating agent, having I. 5 mass% to 6.0 mass% calculated baby Si content is preferably 2.0 mass% to 5.0 mass% Si is a silicon content calculated the coating compositions of the present invention is particularly preferred. 该给出的计算的硅含量相当于在热重分析中以质量％表示的预期硅含量，并且由所使用的原料由此计算，脱除所有在硅上连接的有机基团并且仅考虑一半的在硅上的氧原子。 Calculated silicon content corresponds to the given silicon content expected to thermogravimetric analysis in% by mass, and thereby calculating from the raw materials used, the removal of all organic groups and silicon-bonded on only half of the consideration oxygen atoms in the silicon. 例如，在计算硅份额时考虑每个Si (OR) 3-基团具有SiO,5。 For example, consider when calculating the share of each of the silicon Si (OR) 3- groups having SiO, 5. 这对在硅上带有不同的离去基团OR的漆料体系的可对比性作出贡献。 This may contribute to the comparative coating system with a different leaving group OR on the silicon. 尤其是甲氧基残基和こ氧基残基因此没有改变计算的硅份额。 Especially methoxy residues, and therefore residues ko group share calculation silicon is not changed. 因此这考虑到这些基团OR有很大部分不在包含于固化的漆膜中。 So this in view of these OR groups are not included in the great majority of the cured paint film. 优选地，根据本发明使用的多异氰酸酯含有至少ー种水清除剂，例如具有比异氰酸酯对于水更高活性的活性硅烷。  Preferably, the polyisocyanate according to the present invention contains at least a water scavenger ー species, for example, a ratio of isocyanate reactive silane higher activity for water. 有利地，尤其使用原甲酸三烷基酯作为水清除剂。 Advantageously, in particular a trialkyl orthoformate ester used as a water scavenger. 作为水清除剂，特别优选使用原甲酸三こ酷。 As the water scavenger is particularly preferably used orthoformate ko cool. 优选添加0.01重量％至10重量％，更优选0.03重量％至5. 0重量％的至少ー种水清除剂，基于涂层剂的非挥发性部分的总含量计。 Preferable to add 0.01 wt% to 10 wt%, to 5.0% by weight and more preferably 0.03% by weight of at least ー water scavenger species, based on the total nonvolatile content of the portion of the coating agent. 含异氰酸酯的化合物（B)与化合物（Ia)和（IIa)的反应优选在惰性气氛中于最高100°C，优选最高60°C下进行。  Compound (B) containing isocyanate compound (Ia) and (IIa) is preferably carried out at up to 100 ° C, preferably up to 60 ° C in an inert atmosphere. 优选地，含异氰酸酯的化合物⑶与化合物（Ia)和（IIa)的反应在溶剂中或在溶剂混合物中，在至少ー种水清除剂存在下和在至少ー种胺存在下，优选在至少ー种叔胺，例如1，4_ ニ氮杂双环[2. 2. 2]辛烷（DABCO)、三こ胺和ニ异丙基こ胺，尤其是三こ胺存在下进行。 Preferably, the compound ⑶ isocyanate-containing reaction with the compound (Ia) and (IIa) in a solvent or solvent mixture, in the presence of at least ー kinds of water scavenger and at least ー amines in the presence of, preferably at least ーtertiary amines, e.g. 1,4_ Ni-azabicyclo [2.2.2] octane (DABCO), and three amine ko ko ni isopropyl amine, in particular at three ko presence of an amine. 基于反应混合物的非挥发性部分的总含量计，优选在合成期间添加至少I重量％，优选至少2重量％，特别优选至少3重量％，且非常特别优选至少4重量％的至少ー种水清除剂，优选原甲酸三こ酷。  Based on the total content of the non-volatile portion of the reaction mixture is preferably added during the synthesis of at least I wt.%, Preferably at least 2 wt%, particularly preferably at least 3% by weight and very particularly preferably at least 4% by weight of at least ーwater scavenger species, preferably trimethylorthoformate ko cool. 优选地，在合成期间基于反应混合物的非挥发性部分的总含量计，以I. 5至3. 5重量％的量使用胺。  Preferably, based on the total content of the non-volatile portion of the reaction mixture in an amount I. 5 to 3. 5% by weight of the amine used during the synthesis. 特别优选在合成期间基于反应混合物的非挥发性部分的总含量计，以2至6重量％的量使用三こ胺。 Particularly preferably based on the total content of the non-volatile portion of the reaction mixture, in an amount of 2-6% by weight of tris ko amine during the synthesis. 在其中制备多异氰酸酯固化剂的溶剂或溶剂混合物可以由芳族烃，诸如1，2，4-三甲基苯、均三甲苯、ニ甲苯、丙基苯和异丙基苯组成。  in which the preparation of the polyisocyanate curing agent can be a solvent or solvent mixture of aromatic hydrocarbons, such as 1,2,4-trimethylbenzene, mesitylene, ni toluene, propylbenzene and cumene composition. 合适的由芳族烃组成的溶剂混合物的实例是溶剂油。 Examples of a suitable solvent mixture consisting of an aromatic hydrocarbon solvent is an oil. 在其中制备多异氰酸酯固化剂的溶剂也可以由脂族烃；酮，诸如丙酮、甲基こ基酮或甲基戊基酮；酷，诸如こ酸こ酷、こ酸丁酷、こ酸戊酯或こ氧基丙酸こ酷；醚或者上述溶剂的混合物组成，其中，基于溶剂混合物的总重量计，具有高份额的こ酸丁酷，尤其是至少60重量％的こ酸丁酯的溶剂混合物是优选的。 A solvent in which the preparation of the polyisocyanate curing agent may be hydrocarbon aliphatic; ketones, such as acetone, methyl ko ketone or methyl amyl ketone; cool, such as a ko acid ko cool, ko acid butyl cool, ko acid pentyl ester ko ko cool or propionic acid; or a mixture of the above ether solvents, of which, based on the total weight of the solvent mixture having a high proportion of butyric acid ko cool, especially ko butyl least 60% by weight of a solvent mixture It is preferred. 溶剂混合物特别优选含有至少80重量％的こ酸丁酷，尤其是至少95重量％的こ酸丁酷。 Particularly preferably a solvent mixture comprising at least 80 wt% of butyl cool ko acid, in particular at least 95% by weight of butyl acid ko cool. 非常特别有利的是在纯こ酸丁酯中操作。 Very particularly advantageous in the operation of ko pure butyl acrylate. 可选地，多异氰酸酯固化剂也可以优选由此制备，在第一歩中，将多异氰酸酯，尤其是ニ异氰酸酯的平均每分子最多一个异氰酸酯基团与化合物（Ia)和（IIa)反应，并在第ニ步中将所获得的中间产物通过ニ聚、三聚、形成氨基甲酸酷、形成缩ニ脲或形成脲基甲酸酯反应成多异氰酸酷。  Alternatively, the polyisocyanate curing agent may preferably thus prepared, in a first ho, the most one polyisocyanate, in particular Ni per molecule of isocyanate isocyanate group with the compound (Ia) and (IIa) the reaction, and by Ni, trimeric, is formed in the intermediate carbamate in the second step the obtained Ni cool, ni urea or its reduced form allophanate polyisocyanates reacted to cool. 含异氰酸酯基团的化合物（B)的游离异氰酸酯基团也可以以封闭的形式使用。  Compound (B) containing isocyanate groups, free isocyanate groups can also be used in a closed form. 这在当根据本发明的涂层剂以单组分体系使用的情况下是优选的。 This is the case when the coating composition of the present invention is used in a single component system is preferred. 为了封闭，原则上可以使用一切可用于封闭多异氰酸酯的具有足够低的去封闭温度的封闭剂。 In order to close, blocking agents may all be used for blocking polyisocyanates having a sufficiently low deblocking temperature principle. 这样的封闭剂是本领域技术人员公知的。 Such blocking agents are known to those skilled in the art. 优选使用在EP-AO 626 888和EP-AO 692 007中描述的封闭剂。 Preferably in EP-AO 626 888 and EP-AO 692 007 blocking agents described herein. 多元醇（A)和多异氰酸酯⑶的重量份额优选如此选择，使得含异氰酸酯的化合物（B)的未反应的异氰酸酯基团比含羟基的化合物（A)的羟基的摩尔化学计量比为介于0.9 ： I和I : I. I之间，优选介于0.95 ： I和I. 05 ： I之间，特别优选介于0. 98 ： I和1.02 ： I 之间。 Molar stoichiometry  The polyol (A) and the weight fractions polyisocyanate ⑶ is preferably selected so that the compound containing isocyanate (B) a hydroxyl-containing compound (A) is a hydroxyl isocyanate groups unreacted ratio between 0.9: I and I: I. among I, preferably between 0.95: I and I. 05: between I, particularly preferably between 0.98: between I: I and 1.02. 优选使用各自基于涂层剂的固含量计，含有20至80重量％，优选30至70重量％的至少ー种含羟基的聚丙烯酸酯（A)和/或至少ー种含羟基的聚甲基丙烯酸酯（A)的根据本发明的涂层剂。  Preferably used each based on the solid content of the coating composition, comprising 20 to 80 wt%, preferably 30 to 70 wt% of at least ー polyacrylate species (A) containing hydroxyl and / or hydroxyl group-containing species at least ーpolymethacrylate (a) of the coating agent according to the invention. 优选使用各自基于涂层剂的固含量计，含有20至80重量0A，优选30至70重量0A的至少ー种含异氰酸酯基团的化合物（B)的根据本发明的涂层剂。  Preferably used are each based on the solids content of the coating composition, containing 20 to 80 weight 0A, at least ー preferably 30 to 70 weight 0A coating agent according to the invention compounds containing isocyanate groups, (B) a. 如果是单组分涂层剂，则如此选择含异氰酸酯基团的化合物（B)，使得其游离的异氰酸酯基团用上述封闭剂封闭。  If a single-component coating agent is selected so the compound (B) containing isocyanate groups, such that its isocyanate groups blocked with the closing of the free agent. 在根据本发明优选的2-组分（2K)涂层剂的情况下，在施涂涂层剂之前的短时间内将含有含羟基的化合物（A)以及另外的下文描述的组分的漆组分与含有含异氰酸酯基团的化合物（B)和任选的另外的下文描述的组分的另外的漆组分以本身已知的方式混合，其中含有化合物（A)的漆组分通常含有催化剂以及部分溶剤。 Group  In the case of the present invention according to the preferred 2-component (2K) coating agent, shortly before application of the coating agent containing a hydroxyl group-containing compound (A) and described further below paint component sub component with another component of the paint compound containing isocyanate group-containing (B) and optionally further described below in a manner known per se mixing which comprises the compound (a) is Enamel min and partially soluble catalysts generally contain Ji. 根据本发明的涂层剂任选除含羟基的组分（A)还可以含有ー种或多种不同于组分（A)的含羟基的化合物（C)。  The coating compositions of the present invention optionally other hydroxyl-containing component (A) may further contain a compound (C) containing ー or more than component (A) is a hydroxyl group. 基于多元醇组分（A)+ (C)计，该粘结剂（C)占有10至50重量1^，特别是20至40重量％的份额。 Based on the polyol component (A) + (C) count, the binder (C) occupies 10 to 50 wt ^ 1, in particular 20 to 40 weight percent. 作为含羟基的化合物（C)，既可以使用低分子量的多元醇，也可以使用低聚物型和/或聚合物型多元醇。  As the hydroxyl group-containing compound (C), may be used low molecular weight polyhydric alcohols may be used oligomeric and / or polymeric polyols. 作为低分子量的多元醇，例如使用ニ醇，如优选こニ醇、新戊ニ醇、1，2-丙ニ醇、2，2-ニ甲基-1，3-丙ニ醇、1，4-丁ニ醇、1，3-丁ニ醇、1，5-戊ニ醇、2，2，4-三甲基-1，3-戊ニ醇、I，6-己ニ醇、I，4-环己烷ニ甲醇和I，2-环己烷ニ甲醇，以及多元醇，如优选三羟甲基こ烷、三羟甲基丙烷、三羟甲基己烷、1，2，4_ 丁三醇、季戊四醇以及双季戊四醇。  As the low molecular weight polyols, for example, Ni alcohols, such as alcohols preferably ko ni, ni neopentyl glycol, 1,2-propan-ni-ol, propan-2,2-dimethyl-1,3 ni ni alcohol, 1,4-ni-ol, 1,3-ni-ol, 1,5-ni-ol, 2,2,4-trimethyl-1,3-ni alcohol, I, 6- ni hexyl alcohol, I, 4- cyclohexanedimethanol and methanol ni I, 2- ni cyclohexane methanol, and polyhydric alcohols such as trimethylol ko preferably alkyl, trimethylol propane, trimethylol hexane, 1,2, 4_ butanetriol, pentaerythritol, and dipentaerythritol. 优选将这种低分子量的多元醇以次要的份额掺混到多元醇组分（A)中。  Preferably such a low molecular weight polyol is blended into the minor share of the polyol component (A) is. 作为低聚物型和/或聚合物型多元醇（C)例如使用聚酯多元醇、聚氨酯多元醇、聚硅氧烷多元醇并且优选不同于组分（A)的聚丙烯酸酯多元醇和/或聚甲基丙烯酸酯多元醇，其中作为组分（C)，非常特别优选使用具有至少10°C，尤其是20至80°C的玻璃化转变温度的聚丙烯酸酯多元醇和/或聚甲基丙烯酸酯多元醇。  for example as oligomeric and / or polymeric polyol (C) the polyester polyols, polyurethane polyols, polysiloxane polyols and polyacrylate is preferably different from component (A) polyol alcohol and / or polymethacrylate polyols, wherein as component (C), very particularly preferably having at least 10 ° C, in particular to the glass for 20 to 80 ° C transition temperature of the polyacrylate polyols and / or poly polyhydric alcohol methacrylates. 玻璃化转变温度在这里也类似于组分（A)的玻璃化转变温度的測定经实验測定。 The glass transition temperature here is also similar to the experimentally determined assay components (A) has a glass transition temperature by. 根据本发明的涂层剂优选含有至少ー种用于硅烷基团交联的催化剂（D)。  The coating agent of the present invention contains at least a catalyst (D) silane groups for crosslinking ー species. 实例是具有螯合配体的基于锌或铝的金属络合物，如例如在WO 05/03340中描述的钛酸盐或路易斯酸，但其中在选择催化剂时还应当注意催化剂不会导致涂层剂变黄。 Examples are chelating ligands based on zinc or aluminum metal complexes, such as acid or Lewis acid such as titanium described in WO 05/03340, but the catalyst selected should also be noted that the catalyst does not cause the coating to yellowing agent. 此外，ー些公知使用的催化剂出于毒理学的原因是不太期望的。 Further, some catalysts ー using known toxicological reasons is less desirable. 因此优选的是，作为催化剂（D)使用含磷的，尤其是含磷的和含氮的催化剂。  It is therefore preferred to use a phosphorus-containing catalyst (D), in particular phosphorus-containing and nitrogen-containing catalyst. 在此，也可以使用两种或更多种不同的催化剂（D)组成的混合物。 Here, mixtures of different catalysts (D) two or more kinds may be used. 合适的含磷催化剂（D)的实例是取代的膦酸ニ酯和ニ膦酸ニ酷，优选选自无环的膦酸ニ酷、环状膦酸ニ酷、无环的ニ膦酸ニ酯和环状ニ膦酸ニ酷。  Examples of suitable phosphorus-containing catalyst (D) are substituted phosphonic acid esters, and ni ni ni cool phosphonic acid, preferably selected from acyclic phosphonate cool ni, ni cool phosphonic acid cyclic, acyclic phosphine ni acid esters and cyclic ni ni ni cool phosphonic acid. 这类催化剂例如描述于德国专利申请DE-A-102005045228中。 Such catalysts are described for example in German patent application DE-A-102005045228 in. 且另外还可以是氢（部分酷化)。  and in addition can also be hydrogen (part of the cool). 非常特别优选地，作为催化剂（D)使用相应的胺封闭的磷酸酷，且此时尤其是胺封闭的磷酸こ基己酯和胺封闭的磷酸苯酯，非常特别优选胺封闭的磷酸双（2-こ基己基）酷。  Very particularly preferably, the corresponding amine-blocked acid catalyst as a cool (D), and especially amine-blocked at this time ko-ethylhexyl phosphoric acid esters and amine-blocked phenyl phosphate, very particularly preferably an amine-blocked phosphoric acid bis (2-ethylhexyl ko) cool. 作为用于封闭磷酸酯的胺的实例，尤其可列举叔胺，例如双环胺诸如ニ氮杂双环辛烷（DABCO)、ニ氮杂双环壬烯（DBN)、ニ氮杂双环i^一烯（DBU) ;ニ甲基十二胺或三こ胺。  As examples of the blocked amine phosphate, in particular tertiary amines include, for example, Ni bicyclic amines such as diazabicyclooctane (DABCO), ni diazabicyclononene (DBN), diazabicyclo i ^ ni ene (of DBU); ni dimethyldodecylamine amine or tri-ko. 特别优选地，为封闭磷酸酯使用叔胺，其在140°C的固化条件时保证良好的催化剂效果。 Particularly preferably, a tertiary amine phosphate closed, which guarantees a good catalytic effect when curing conditions to 140 ° C.  某些用胺封闭的磷酸催化剂也是可商购的（例如King Industries公司的Nacure-型)。  Some amines blocked with acid catalysts are also commercially available (e.g. type Nacure- King Industries Company). 例如可列举King Industries公司名为Nacure 4167作为特别合适的基于胺封闭的磷酸偏酯的催化剂。 Examples thereof include company called King Industries as Nacure 4167 catalyst based Particularly suitable amine-blocked phosphoric acid partial esters. 基于根据本发明涂层剂的非挥发性成分计，催化剂优选以0. 01至20重量％的份额，特别优选以0. I至10重量％的份额使用。  Based to 0.01 to 20 wt.% Share, particularly preferably 0. I to 10% by weight of the share according to the nonvolatile constituents of the coating agent of the present invention, the catalyst is preferred. 在此，低的催化剂效果可以通过相应的更高的使用量部分地弥补。 Here, low catalyst effect can be compensated by a higher amount of the respective part. 根据本发明的涂层剂还可以含有另外的胺催化剂，所述催化剂基于双环胺，尤其是不饱和的双环胺。  may further contain additional amine catalyst coating agent according to the present invention, the bicyclic amine-based catalyst, in particular unsaturated bicyclic amines. 合适的胺催化剂的实例是1，5_ ニ氮杂双环[4.3.0]壬-5-烯或1，8- ニ氮杂双环[5. 4. 0] i^一碳-7-烯。 Examples of suitable amine catalysts are 1,5_ ni diazabicyclo [4.3.0] non-5-ene or 1,8-Ni-diazabicyclo [5. 4. 0] i ^ a-7-ene. 基于根据本发明的涂层剂的非挥发性成分计，这些胺催化剂优选以0. 01至20重量％的份额，特别优选以0. I至10重量％的份额使用。  The basis of the nonvolatile constituents of the coating composition of the present invention, the amine catalyst is preferably 0.01 to 20 wt.% Share, particularly preferably 0. I to 10% by weight of the share. 作为用于根据本发明的涂层剂的溶剂尤其合适的是，在涂层剂中对化合物（A)、(B)和任选的（C)是化学惰性的，并且在涂层剂固化时它们还不与（A)和（B)反应。  As the solvent for the coating agent according to the present invention is particularly suitable in the coating agent to the compound (A), (B) and optionally (C) is chemically inert, and the coating they are not (B) reacted with (A) and curing time. 这样的溶剂的实例是脂族和/或芳族烃，诸如甲苯；ニ甲苯；溶剂油；Solvesso 100或Hydrosol®(ARAL公司）；酮，诸如丙酮、甲基こ基酮或甲基戊基酮；酷，诸如こ酸こ酷、こ酸丁酷、こ酸戊酯或こ氧基丙酸こ酷；醚或由上述溶剂组成的混合物。 Examples of such solvents are aliphatic and / or aromatic hydrocarbons, such as toluene; ni toluene; solvent oil; Solvesso 100 or Hydrosol® (ARAL Corporation); ketones, such as acetone, methyl ko ketone or methyl amyl ketone ; cool, such as acid ko ko cool, cool ko acid butyl, pentyl ester or acid ko ko ko cool propionic acid; an ether or a mixture of the above solvents. 优选地，非质子溶剂或溶剂混合物具有基于溶剂计最多I重量％，特别优选最多0. 5重量％的水含量。 Preferably, an aprotic solvent or solvent mixture having a solvent at most I wt%, particularly preferably at most 0.5% by weight based on the water content. 除化合物（A)、⑶和任选的（C)以外，还可以使用另外的粘结剂（E)，其优选能够与聚（甲基）丙烯酸酯（A)的羟基和/或与化合物⑶的游离异氰酸酯基团和/或与化合物⑶和/或（C)的烷氧基甲硅烷基反应，井能够形成网络节点。  other than the compound (A), ⑶ and optionally (C), additional binder may be used (E), which is preferably capable of the poly (meth) acrylic hydroxy ester (A) and / or ⑶ compound of free isocyanate groups and / or ⑶ compound and / or (C) the reaction of an alkoxysilyl group, the network node can be formed well. 例示性地，作为组分（E)可使用的是氨基树脂和/或环氧树脂。  Illustratively, as component (E) may be used are amino resins and / or epoxy resins. 常规的和已知的氨基树脂在考虑之内，它们的羟甲基和/或甲氧基甲基可以部分地通过氨基甲酸酯基团或脲基甲酸酯基团去官能化。 Conventional and known amino resins within the contemplation of methylol and / or methoxymethyl may be partially defunctionalized by urethane groups or allophanate groups. 这种类型的交联剂描述于专利文献US-A-4 710 542和EP-BO 245 700,以及B. Singh 和其同事的论文“Carbamylmethylated Melamines, Novelし;ross—1 inkers for the Coatings 丄ndustry，，,Advanced Organic Coatings Science andTechnology Series, 1991,第13 卷，第193 至207 页中。 This type of crosslinking agents are described in US-A-4 710 245 700, and Patent Document paper 542 and EP-BO B. Singh and colleagues "Carbamylmethylated Melamines, Novel shi; ross-1 inkers for the Coatings Shang ndustry ,,, Advanced Organic Coatings Science andTechnology Series, 1991, Vol. 13, pp. 193-207. 通常，这样的组分（E)以高达40重量％的份额，优选高达30重量％的份额，特别优选高达25重量％的份额使用，基于涂层剂的非挥发性成分计。  Generally, such a component (E) up to 40 wt.% Share, preferably up to 30 wt% of the share, particularly preferably up to 25 wt.% Share of use, based on the nonvolatile constituents of the coating composition. 此外，根据本发明的粘结剂混合物或者根据本发明的涂层剂可以以有效量含有至少ー种常规和已知的漆料添加剂（F)，即以优选高达30重量％的量，特别优选高达25重量％的量，尤其是高达20重量％的量，各自基于涂层剂的非挥发性成分计。  In addition, the binder mixture according to the invention or may contain the coating composition of the present invention in an effective amount of at least ー species customary and known paint additives (F.), I.e., an amount of preferably up to 30% by weight , particularly preferably up to an amount of 25% by weight, in particular up to 20% by weight, each based on the nonvolatile constituents of the coating composition. -反应性稀释剂，诸如现有技术中通常已知的，且其优选对-Si (OR) 3-基团惰性。  - a reactive diluent, such as is generally known in the prior art, and which preferably (OR) 3- groups inert to the -Si. -已经在上文列举的水清除剂。  - it has already been mentioned above in water scavenger. 在另一本发明的实施方式中，根据本发明的粘结剂混合物或者根据本发明的涂层剂还可以含有另外的顔料和/或填料，并且用于生产着色的面漆。  In another embodiment of the present invention, the binder or the mixture according to the invention may also contain additional pigments and / or fillers of the coating composition of the present invention, and for the production of pigmented topcoat. 为此所使用的顔料和/或填料是本领域技术人员已知的。 Pigment and / or filler used for this purpose are known to the skilled person. 因为由根据本发明的涂层剂制备的根据本发明涂层也能优异地粘附在已经固化的电泳涂漆、二道漆、底涂漆或常规的和已知的清漆上，所以它们除了适用于在汽车系列涂漆（OEM)中使用以外，优异地适用于汽车修补涂漆或已经涂装过的汽车车体的模块化防刮伤配置。  Since the coating according to the present invention in accordance with excellent adhesion can be prepared coating agent in the present invention have been cured electrodeposition coating, two paint, basecoat or conventional and known varnishes, in addition they are suitable for use in automotive OEM finishing (OEM) other than, excellently suitable for automotive repair painting or have modular scratch coating disposed over the automobile body. 根据本发明的涂料组合物的施涂可以通过所有常规的施涂方法来进行，例如喷涂、刮涂、刷涂、烧注、浸涂、浸溃、滴涂或棍涂。  can be carried out by all conventional application method of applying the coating composition according to the present invention, such as spraying, knife coating, brushing, injection burning, dip coating, dipping, drop coating, or bar coating. 在此，可以将待涂的基底本身浄止，而移动施涂装置或设备。 Here, the substrate may be coated net stopper itself and the mobile device application or device. 然而，也可以移动待涂基底（尤其是卷材），而施涂设备相对基底静止或以合适的方式移动。 However, the substrate to be coated may be moved (particularly the web), and the application equipment is relatively stationary or moving the substrate in a suitable manner. 优选使用喷涂方法，例如压缩空气喷涂、无气喷涂、高速旋转、静电喷涂（ESTA)Ji选结合热喷涂，例如热空气-热喷涂。  Preferably spray coating method, for example, air spray, airless spray, high-speed rotation, electrostatic spray (ESTA) Ji selected combination of thermal spraying, for example, hot air - thermal spraying. 施涂后的根据本发明的涂层剂的固化可以在一段静置时间之后进行。  may be carried out after a period of standing time after application The curable coating compositions of the present invention. 静置时间例如用于漆层的流平和脱气或者用于挥发性成分如溶剂的挥发。 Rest time for example leveling or lacquer degassed for volatilization of the volatile constituents such as solvents. 只要在此不出现漆层损害或变化，例如过早地完全交联，则可以通过施加提高的温度和/或通过降低的空气湿度来促进和/或缩短静置时间。 As long as paint damage or change does not appear in this case, for example, premature complete crosslinking, by applying the elevated temperature and / or facilitated by a decrease of the air humidity and / or shorten the rest time. 涂层剂的热固化不具有方法上的特殊性，而是按照常规和已知的方法来进行，如在通风炉中加热或用红外灯辐照。 The thermal  curing the coating agent does not have a method of particularity, but according to conventional and known methods to carry out, such as heating or irradiation with an infrared lamp in a ventilated oven. 在此，热固化也可以分阶段进行。 Here, the thermal curing may be carried out in stages. 另ー优选的固化方法是用近红外线（NIR-辐射）固化。 Another preferred curing method ー curing by near infrared (NIR-radiation). 热固化有利地在30至200°C、特别优选40至190°C且尤其是50至180°C的温度下,于Imin至IOh,特别优选2min直到5h且尤其是3min至3h的时间期间进行,其中在用于汽车修补涂漆的温度和用于漆涂塑料部件的温度（优选介于30和90°C之间）下，也可以采用更长的固化时间。  Thermal curing is advantageously 30 to 200 ° C, particularly preferably 40 to 190 ° C and in particular at a temperature between 50 to 180 ° C, to Imin to IOH, particularly preferably 2min until 5h and especially 3min to 3h of during the time in which the temperature in the paint for automotive repair lacquer coating and temperature for the plastic parts (preferably between 30 and 90 ° C), the curing can also be used for longer time. 根据本发明的涂层剂提供新的固化涂层，尤其是涂漆，特别是清涂漆；模制件，特别是光学模制件；和自支撑薄膜，它们是高耐刮擦的，其中所述高耐刮擦即使在长时间负荷之后也能保持。  The cured coating provides new coating compositions according to the present invention, in particular painting, especially clearcoat; moldings, especially optical moldings; and self-supporting film, which is a high scratch wherein said high scratch can be maintained even after prolonged load. 同时，根据本发明获得的涂层由于埃氏杯突测试时的良好结果和良好的抗石击性能而出色。 Meanwhile, the coating according to the present invention due to the good results obtained by projecting the test Eppendorf cups and a good performance and excellent anti-chip. 此外，根据本发明获得的涂层还具有非常好的视觉总体印象。 Further, according to the present invention, the coating obtained also has very good overall visual impression. 最后，根据本发明的涂层和涂漆，特别是清涂漆能够即使以> 40 的层厚制得，也不出现应カ裂纹。 Finally, the coating and paint according to the present invention, especially the clearcoat can be made even at a layer thickness> 40 too, does not appear to be cracks ka. 因此，根据本发明的涂层剂特别适合作为移动工具（尤其是机动车，如摩托车、公共汽车、载重车或乘用车）的车身或其部件的；建筑物（室内或户外）的；家具、窗户和门的；塑料模制件（尤其是CD和窗）的；小型エ业部件的；卷材、容器和包装的；白色商品的；膜的；光学、电气工程和机械组件的；以及玻璃中空体和日常用品的装饰性、保护性和/或赋予效果的高耐刮擦性涂层和涂漆。  Thus, the coating compositions of the present invention is particularly suitable as a mobile tool (particularly motor vehicles, such as motorcycles, buses, trucks or passenger) of a vehicle body or component thereof; building (indoor or outdoor ); a furniture, windows and doors; plastic molding (especially CD and windows); small sector member Ester; coils, containers and packaging; white goods; film; optical, mechanical and electrical engineering and a decorative, protective and / hollow glass body and daily necessities or effect of a high scratch resistant coating and painting; assembly. 尤其是，根据本发明的涂层剂和涂漆，尤其是清涂漆用于在技术和外观方面要求特别要求苛刻的汽车系列涂漆（OEM)领域，并用于涂覆用于乘用车车身、尤其是高级乘用车车身的塑料组件，例如用于制造车顶、后盖、发动机盖、挡泥板、保险杠、扰流板、车门槛、保护条、侧面装饰物等等；以及汽车修补涂漆领域中。  In particular, the paint and coating compositions of the present invention, in particular a clearcoat require special demanding automotive OEM finishing (OEM) in the field of art and appearance, and used for coating by car body, especially for luxury cars and the body of plastic components, for example for the manufacture of a roof, a rear cover, hood, fenders, bumpers, spoilers, rocker, protective strips, side garnish, etc. ; and automotive refinish field. 塑料组件通常由ASA、聚碳酸酷、ASA和聚碳酸酯的混合物、聚丙烯、聚甲基丙烯酸甲酯或抗冲改性的聚甲基丙烯酸甲脂组成，尤其是由ASA和聚碳酸酯的混合物组成，优选以聚碳酸酯份额> 40%，尤其> 50%使用。  Typically plastic components, a polycarbonate cool ASA, a mixture of ASA and polycarbonate, polypropylene, polymethyl methacrylate or impact-modified polymethyl methacrylate lipid composition, in particular of the ASA and poly carbonate mixture, preferably of polycarbonate share> 40%, especially> 50% use. ASA在此通常理解为抗冲改性的苯こ烯/丙烯腈聚合物，其中こ烯基芳族化合物(尤其是苯こ烯）的接枝共聚物和こ烯基氰（尤其是丙烯臆）的接枝共聚物在聚丙烯酸烷基酯橡胶上于尤其是苯こ烯和丙烯腈构成的共聚物矩阵中存在。  ASA herein is generally understood to impact-modified benzene ko / acrylonitrile polymer, wherein the alkenyl aromatic compound ko (ko-ene particularly benzene) and a graft copolymer ko alkenyl cyanide (especially addiction propylene) copolymer to graft on polyalkyl acrylate rubbers particularly benzene copolymer matrix composed of ko and acrylonitrile present. [0171 ] 特别优选将根据本发明的涂层剂用于多步涂层方法中，尤其是首先在任选预涂覆的基底上施涂颜料着色的底涂漆层，和随后施涂具有根据本发明的涂层剂的层的方法。  Particularly preferred coating compositions according to the invention for coating a multi-step process, in particular in pigmented first applied on an optionally precoated substrate basecoats, and subsequently applied in accordance with the method of coating agent layer of the present invention. 因此，本发明的主题还有由至少ー层顔料着色的底涂漆层和至少ー层设置在其上的清漆层组成的赋予效果和/或赋予色彩的多层涂漆，其特征在于，所述清漆层由根据本发明的涂层剂制备。 Thus, subject of the present invention is also given by the least effect basecoats ー pigmented layer and the layer provided thereon at least ー varnish layer on the composition and / or color-imparting paint systems, characterized by said clearcoat coating composition prepared in accordance with the present invention. 既可以使用可水稀释的底漆，也可以使用基于有机溶剂的底漆。  may be used either water dilutable primers may be used an organic solvent-based primer. 合适的底漆例如描述在EP-AO 692 007和在其中的第3栏，第50行及其后所引用的文献中。 Suitable primers are described for example in EP-AO 692 007 and in column 3 therein, after the line 50 and references cited therein. 优选首先干燥施涂的底漆，即在蒸发阶段从底漆膜中除去至少一部分有机溶剂或者水。 Preferably first dried primer applied, i.e. at least a portion of the organic solvent or removing water from the evaporation stage in the primer film. 优选在室温至80°C的温度下进行干燥。 Dried at room temperature and preferably at a temperature to 80 ° C. 干燥后施涂根据本发明的涂层剂。 After drying the applied coating composition according to the present invention. 随后，优选在汽车系列涂漆所使用的条件下，在30至200°C、特别优选40至190°C且非常特别优选50至180°C的温度下，于Imin至10h、特别优选2min到5h且尤其是3min至3h的时间内烘烤双层涂漆，其中，在用于汽车修补涂漆所采用的温度（优选介于30和90°C)下，也可以采用更长的固化时间。 Under Subsequently, preferably under the conditions used in automotive OEM finishing, at 30 to 200 ° C, particularly preferably 40 to 190 ° C and very particularly preferably from 50 to 180 ° C to a temperature at Imin to 10H, particularly preferably from 2min to 5h time 3min and in particular to double 3h baking paint, wherein the paint for automotive repair temperature employed (preferably between 30 and 90 ° C), the curing time may be longer employed . 采用根据本发明的涂层剂制得的涂层特别是由于特别高的耐刮擦性（即使在长期负荷之后）而出色，并同时显示出在埃氏杯突测试时的良好结果以及良好的防石击性质。  The coating composition made according to the present invention the coating is obtained in particular due to the particularly high scratch resistance (load even after long-term) and excellent, and also showed good results when tested Erichsen as well as a good anti-stoning nature. 最后，其还具有非常好的视觉总体印象。 Finally, it also has a very good overall visual impression. 在另一本发明的优选实施方式中，根据本发明的涂层剂作为清漆用于涂覆塑料基底，尤其是塑料组件。  In a further preferred embodiment of the present invention, the coating composition of the present invention as a varnish for coating plastic substrates, particularly plastic components. 塑料基底同样优选在多步涂层方法中涂覆，其中首先在任选预涂覆或为改进后续涂层的粘附而预处理的基底（例如基底的火焰喷涂、电晕处理或等离子体处理）上施涂颜料着色的底涂漆层，和随后施涂具有根据本发明的涂层剂的层。 Also preferably coated plastic substrate in a multistage coating process, wherein the first substrate (e.g., flame spraying the substrate, a plasma treatment, or corona treatment or is optionally pre-coated to improve adhesion of subsequent coating pretreated ) applying the pigmented basecoats, and then applying a layer of the coating agent according to the invention. 最后，根据本发明的涂层剂作为透明清漆用于涂覆透明的塑料基底。  Finally, the coating composition of the present invention as a transparent plastic substrate coated with a transparent varnish. 在这种情况下，涂层剂包含紫外吸收剂，其在用量和种类方面也经设计以有效地对塑料基底进行紫外防护。 In this case, the coating contains an ultraviolet absorber, which is also effective UV protection for the plastic substrate is designed in terms of amount and kind. 在这里，获得的涂层还由于耐刮擦性（即使在长期复合吋）和同时在埃氏杯突测试时非常好的性质的优异组合而出色。 Here, because the coating obtained also scratch resistance (even during long composite inch) and at the same time Erichsen test excellent very good combination of properties and excellent. 如此涂布的透明塑料基底优选用于汽车制造中玻璃组件的替代品，其中所述塑料基底优选由聚甲基丙烯酸甲酯或聚碳酸酯构成。 The thus coated transparent plastic substrate is preferably used for manufacturing automotive glass alternative assembly, wherein said plastic substrate is preferably formed of polymethyl methacrylate or polycarbonate. 在配有温度计、锚式搅拌器、2个滴液漏斗和回流冷凝管的可借助油循环恒温加热的双壁的41不锈钢釜中为了聚合预置溶剤。  In order to polymerize the pre-dissolved Ji 41 stainless steel autoclave equipped with thermometer, anchor stirrer, two dropping funnels and a reflux condenser may be heated by a thermostatic oil circulation in the double wall. 在一个滴液漏斗中预置单体混合物，在第二个滴液漏斗中预置含有合适的引发剂（通常是过氧化物）的引发剂溶液。 Preset a monomer mixture in the dropping funnel, containing a preset suitable initiator (typically a peroxide) initiator solution in a second dropping funnel. 将预置物加热至140°C的聚合温度。 The pre-heated to the polymerization temperature to 140 ° C. 在达到聚合温度之后，首先开始引发剂进料。 After reaching the polymerization temperature, initiator feed is first started. 在引发剂进料开始15分钟后，开始单体进料（持续240分钟）。 After the initiator feed began 15 minutes, beginning the monomer feed (for 240 minutes). 如此调节引发剂进料，它在结束单体进料之后再接着进行另外的30分钟。 Thus adjusting the initiator feed, which then followed by the monomer feed ended after a further 30 minutes. 在结束引发剂进料后，将混合物于140°C搅拌另外的2h井随后冷却至室温。 After the end of the initiator feed, the mixture was further stirred at 140 ° C 2h, then cooled to room temperature wells. 随后将反应混合物用溶剂调节至表2中给出的固含量。 The reaction mixture was then solvent was adjusted to a solids content of Table 2 below. 在配有回流冷凝管和温度计的三颈玻璃烧瓶中预置51. 4份三聚的六亚甲基ニ异氰酸酯（HDI) (Desmodur N3600, Bayer Material Science 公司）、2. 4 份原甲酸三こ酯和17. 8份こ酸丁酷。  51.4 parts of trimeric preset three-necked glass flask equipped with a reflux condenser and a thermometer Ni hexamethylene diisocyanate (HDI) (Desmodur N3600, Bayer Material Science Corporation), 2.4 parts of the original acid triethyl ester ko ko acid and 17.8 parts of butyl cool. 在氮气层和搅拌下如此计量添加由26. 4份双-[3-(甲氧基甲硅烷基）丙基]月安(Dynasylan 1124, Degussa 公司，Rheinfelden)和2.0 份N-[_3_(甲氧基甲娃烧基）-丙基]丁胺（Dynasylan 1189, Degussa公司，Rheinfelden)组成的混合物,使得不超过50°C。 Thus metered in with stirring under a nitrogen blanket and 26.4 parts of bis - [3- (methoxy-silyl) propyl] An month (Dynasylan 1124, Degussa Corporation, Rheinfelden), and 2.0 parts of N - [_ 3_ (A a baby burn-yl oxy) - propyl-] butylamine (Dynasylan 1189, Degussa Corporation, Rheinfelden) composed such that no more than 50 ° C. 结束计量添加后，将反应温度在50°C保持60分钟。 After the metered addition, the reaction temperature was maintained at 50 ° C 60 min. 封闭度借助于滴定检查NCO=8. 1% )。 Closed by means of titration check NCO = 8. 1%). 该固化剂具有80重量％的非挥发性份额。 The curing agent has 80% by weight of nonvolatiles. 在配有回流冷凝管和温度计的三颈玻璃烧瓶中预置53. 4份三聚的六亚甲基ニ异氰酸酯（HDI) (Desmodur N3600, Bayer Material Science 公司）、2. 4 份原甲酸三こ酯和17. 6份こ酸丁酷。  53.4 parts of trimeric preset three-necked glass flask equipped with a reflux condenser and a thermometer Ni hexamethylene diisocyanate (HDI) (Desmodur N3600, Bayer Material Science Corporation), 2.4 parts of the original acid triethyl ester ko ko acid and 17.6 parts of butyl cool. 在氮气层和搅拌下如此计量添加由18. 2份双-[3-(甲氧基甲硅烷基）丙基]月安(Dynasylan 1124, Degussa 公司，Rheinfelden)和8.4份1^-[-3_(甲氧基甲娃烧基）-丙基]丁胺（Dynasylan 1189, Degussa公司，Rheinfelden)组成的混合物,使得不超过50°C。 Thus 18.2 parts of a metered double layer and with stirring in a nitrogen - [3- (methoxy-silyl) propyl] An month (Dynasylan 1124, Degussa Corporation, Rheinfelden) and 8.4 parts of 1 ^ - [- 3_ (methoxymethyl baby burn-yl) - propyl] butylamine (Dynasylan 1189, Degussa Corporation, Rheinfelden) mixtures thereof, such that no more than 50 ° C. 结束计量添加后，将反应温度在50°C保持60分钟。 After the metered addition, the reaction temperature was maintained at 50 ° C 60 min. 封闭度借助于滴定检查NCO=8.3%)0该固化剂具有80重量％的非挥发性份额。 Checking by means of titration of blocking NCO = 8.3%) 0 The curing agent having 80% by weight of nonvolatiles. 在配有回流冷凝管和温度计的三颈玻璃烧瓶中预置55. 4份三聚的六亚甲基ニ异氰酸酯（HDI) (Desmodur N3600, Bayer Material Science 公司）、2. 4 份原甲酸三こ酯和17.6份こ酸丁酷。  55.4 parts of trimeric preset three-necked glass flask equipped with a reflux condenser and a thermometer Ni hexamethylene diisocyanate (HDI) (Desmodur N3600, Bayer Material Science Corporation), 2.4 parts of the original acid triethyl ester ko ko acid and 17.6 parts of butyl cool. 在氮气层和搅拌下如此计量添加由9. 5份双-[3-(甲氧基甲硅烷基）丙基]月安(Dynasylan 1124, Degussa 公司，Rheinfelden)和15.2份1^-[-3_(甲氧基甲娃烧基）-丙基]丁胺（Dynasylan 1189, Degussa公司，Rheinfelden)组成的混合物,使得不超过50°C。 Thus 9.5 parts of the metered double layer and with stirring in a nitrogen - [3- (methoxy-silyl) propyl] An month (Dynasylan 1124, Degussa Corporation, Rheinfelden), and 15.2 parts of 1 ^ - [- 3_ (methoxymethyl baby burn-yl) - propyl] butylamine (Dynasylan 1189, Degussa Corporation, Rheinfelden) mixtures thereof, such that no more than 50 ° C. 结束计量添加后，将反应温度在50°C保持60分钟。 After the metered addition, the reaction temperature was maintained at 50 ° C 60 min. 封闭度借助于滴定检查NCO=8.6%)0该固化剂具有80重量％的非挥发性份额。 Checking by means of titration of blocking NCO = 8.6%) 0 The curing agent having 80% by weight of nonvolatiles. 作为固化剂（B4),使用市售的三聚的六亚甲基ニ异氰酸酯（HDI) (DesmodurN3600, Bayer Material Science 公司)。  As the curing agent (B4), using a commercially available trimeric Ni hexamethylene diisocyanate (HDI) (DesmodurN3600, Bayer Material Science Company). 由在表3中给出的组分由此制备根据本发明的实施例I至4的清漆和对比实施例Vl至V8的清漆，合并在表3中给出的组分并搅拌直至产生均质混合物。  Thus prepared from the components set forth in Table 3 according to embodiments of the present invention I to 4 and Comparative Examples varnish embodiment Vl to V8 varnish components combined are given in Table 3, and stirred until produce a homogeneous mixture. 涂层性质的测试在将涂层剂在2. 5巴于3个喷涂通道中气动施涂到BASFCoatings AG公司的市售的单色黒水性底漆上之后进行。  Tests performed after coating properties of the coating agent in the 2.5 to 3 bar spray applied to the pneumatic channels BASFCoatings AG company commercially available monochrome black waterborne basecoat. 将底涂漆事先施涂在Chemetall公司的市售的磷酸盐处理的钢制金属板上，所述金属板用BASF Coatings AG公司的市售的、烘烤过的电泳漆和用BASF Coatings AG公司的市售的、烘烤过的底漆涂覆。 The basecoat was applied in advance in a steel metal plate commercially available from Chemetall phosphate treatment, the metal plate BASF Coatings AG company commercially available electrophoretic paint and baked by the company BASF Coatings AG the commercial, baked primer coating. 然后将各自得到的涂层在室温脱气5分钟并随后在140°C烘烤22分钟。 Then each resulting coating and then baked 22 minutes at room temperature and degassed at 140 ° C for 5 minutes. 得到的涂层表面的耐刮擦性借助于摩擦牢度测试（根据EN ISO 105-X12用10次来回敲击和采用9 ii m砂纸（3M 281Q wetordryTMproductionTM), 9N的施加力），随后用市售的光泽度测定仪在20°測定的残余光泽度来測定。  scratch resistance of the coating surface by means of a rubbing fastness test is obtained (according to EN ISO 105-X12 back and forth 10 times with tap and 9 ii m using sandpaper (3M 281Q wetordryTMproductionTM), applying a force of 9N), the analyzer is then measured at 20 ° residue glossiness measured using a commercially available gloss. 得到的涂层的埃氏杯突根据DIN EN ISO 1520测定。  Erichsen cup projections obtained coating was measured according to DIN EN ISO 1520. 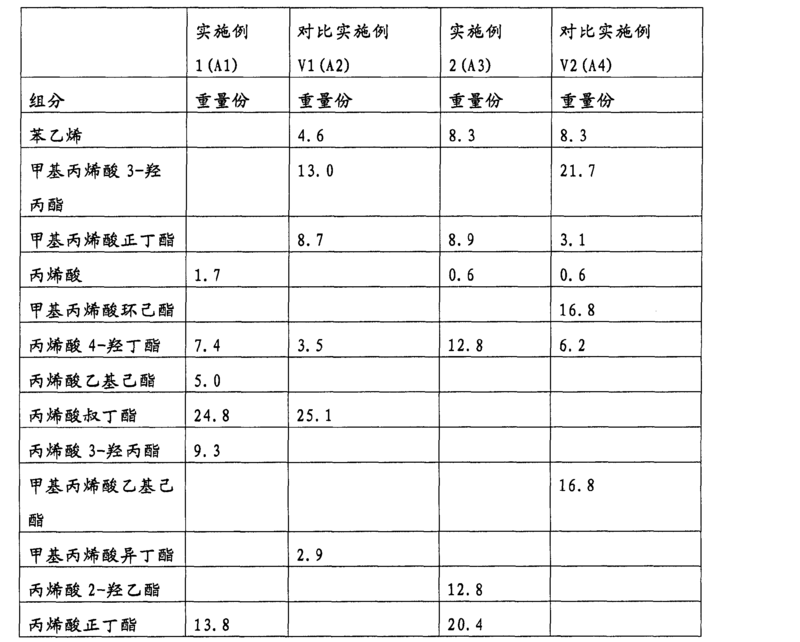 防石击性质的测试按照ISO 20567-1 =2007-1用2次500g轰击材料和2巴压カ进行。  Testing in accordance with the nature of the anti-stoning ISO 20567-1 = 2007-1 be bombarded twice with 500g 2 bar pressure and material grades. 目视评价受损区域，其中特征值0.5表示具有最低受损区域的最佳值，和特征值5.0表示具有最大受损区域的最差值。 Damaged area was visually evaluated, wherein the feature value having the lowest optimal value 0.5 represents the damaged area, and the feature value having the largest value 5.0 represents the worst damaged areas. D =以质量％表示的理论计算的硅含量。  D = theoretically calculated silicon content expressed in mass%. 其从所使用的原料由此计算，脱除所有在硅上连接的有机基团且仅考虑一半的在硅上的氧原子。 Thereby calculating from the raw material which is used, removal of all organic groups on the silicon, and connected to an oxygen atom to consider only half on silicon. 实施例I和2与对比实施例V4的对比显示出，在相同的粘结剂和相同的硅烷化程度（30mol%)时，随着单硅烷结构单元（I)的升高的份额和双硅烷结构单元（II)的相应降低的份额，埃氏杯突升高。  Comparative Example I Comparative Example V4 shows and embodiment 2, when the same adhesive and the same degree of silylation (30mol%), with the increase of monosilane structural unit (I) share and a corresponding decrease in the share of bis-silane structural unit (II), the Erichsen increased. 更确切地讲，同时即使耐刮擦性降低，在具有埃氏杯突的最佳值的实施例2中仍保持在非常高的水平，即达到了非常好的耐刮擦性。 More precisely, even while the scratch resistance decreases, in the second embodiment has the optimum value Erichsen remained at a very high level, i.e., to achieve very good scratch resistance. 耐刮擦性和埃氏杯突与结构单元（I)比结构单元（II)的比例之间的相同依赖性在将实施例3和4与对比实施例V8进行对比时也是明显的。  scratch resistance and Erichsen same dependency between the structural unit ratio of the structural units (II) (I) of embodiment when compared with Comparative Example V8 Examples 3 and 4 will also be apparent . 在这里在相同的粘结剂和相同的硅烷化程度时，随着单硅烷结构单元（I)的升高的份额和双硅烷结构单元（II)的相应降低的份额，埃氏杯突也升高并且耐刮擦性降低。 Here at the same binder and the same degree of silanization, with a corresponding reduction in the share of the share elevated monosilane structural units (I) and bis-silane structural unit (II), and also rose Erichsen and high scratch resistance decreases. 耐刮擦性和埃氏杯突与结构单元（I)比结构单元（II)的比例之间的相同依赖性在其余将对比实施例V1、V2和V3进行对比时以及将对比实施例V5、V6和V7进行对比时也观察到了。  scratch resistance and Erichsen same dependency between the structural unit ratio of the structural units (II), (I) when compared to rest of the Comparative Examples V1, V2 and V3 comparative embodiment and the embodiment Example V5, V6 and V7 are also observed when compared. 在此还应注意，涂层的耐刮擦性恰好不但通过使用根据本发明的交联剂（B)，而且令人惊讶地通过根据本发明使用具有低于10°C的玻璃化转变温度的（甲基）丙烯酸酯多元醇（A)来改进。  It should also be noted here, scratch resistant coating not only by using exactly (B), surprisingly and according to the invention by the use of a glass having a minimum 10 ° C according to the present invention, a crosslinking agent the transition temperature of the (meth) acrylate esters of polyols (a) be improved. 因此实施例I与对比实施例V2的对比显示出，在相同的硅烷化程度和相同的40mol%的单硅烷结构单元（I)和60mol%的双硅烷结构单元（II)的比例以及相同的粘结剂OH值的情况下，如实施例I中使用根据本发明的具有低于10°C的玻璃化转变温度的粘结剂时比如对比实施例V2中使用具有高于10°C的玻璃化转变温度的粘结剂时达到了明显更高的耐刮擦性。 Accordingly Example I Comparative Comparative Example V2 showed embodiment, the ratio of the same silanized degree and the same 40mol% monosilane structural units (I) and 60mol% of bis-silane structural unit (II) and the same viscosity Example Comparative example V2 in the case where the OH value of the use of coalescent, as the binder used in Example I having a transition temperature in accordance with the present invention is 10 ° C lower than the glass above the glass embodiment having the 10 ° C reached significantly higher scratch resistance when the transition temperature of the binder. 尽管这升高了实施例I的涂层的耐刮擦性，但是这种基于使用根据本发明的具有低于10°C的玻璃化转变温度的粘结剂的涂层同时还具有相对于相应的对比实施例V2改进的埃氏杯突。 Although this increases the scratch resistance of the coatings according to Example I, but such coatings based on using the binder has a glass transition temperature of minimum 10 ° C of the present invention also with respect to the respective Example V2 improved Erichsen comparative embodiment. 这同样通过实施例3与对比实施例V6的对比得到证实。  This is also confirmed by comparison with Comparative Example in Example 3 V6. 实施例3与对比实施例V6的对比也显示出，在相同的硅烷化程度和相同的40mol%的单硅烷结构单元（I)和60mol%的双硅烷结构单元（II)的比例以及相同的粘结剂OH值的情况下，如实施例3中使用根据本发明的具有低于10°C的玻璃化转变温度的粘结剂时比如对比实施例V6中使用具有高于10°C的玻璃化转变温度的粘结剂时达到了明显更高的耐刮擦性。 Comparison of V6 Comparative Example Example 3 also shows that the proportion of the same silanized degree and the same 40mol% monosilane structural units (I) and 60mol% of bis-silane structural unit (II) and the same viscosity OH value in the case caking agent, as in Example 3 using, for example V6 Comparative Example used in the examples has a glass of above 10 ° C 10 ° C when the glass transition temperature of the binder according to the present invention has less than reached significantly higher scratch resistance when the transition temperature of the binder. 尽管这升高了实施例3的涂层的耐刮擦性，但是这种涂层同时还具有相对于相应的对比实施例V6改进的埃氏杯突。 Although this increases the scratch resistant coating of Example 3, but this coating and also with respect to the embodiment Erichsen V6 corresponding contrast improvement. 相应地，此外这也通过实施例2与对比实施例V3的对比和通过实施例4与对比实施例V7的对比得到确认。  Accordingly, in addition to which Comparative Example 2 Comparative embodiment V3 and confirmed by comparison with Comparative Example Example 4 V7 examples. 只有通过根据本发明的具有低于10°C的玻璃化转变温度的粘结剂与根据本发明的用结构单元（I)和（II)改性的固化剂（B)的组合才达到了提供根据本发明的涂层剂和由此制备的涂层的目的，所述涂层不但由于高的耐刮擦性而且同时由于良好的埃氏杯突，以及由于良好的防石击性质而出色。  Only in combination with a structural unit according to the present invention (I) and (II) a curing agent modifier (B) based on the binder having a glass transition temperature of minimum 10 ° C until the present invention and reached the object of providing a coating in accordance with the present invention, a coating agent thus prepared, the coating is not only due to high scratch resistance and at the same time due to good Erichsen, and because of the good properties of the anti-stoning and outstanding. 长期耐刮擦性的测试，即在多次反复的刮擦负荷之后涂层的残余光泽度的测试在这里也对于根据本发明制备的涂层剂显示非常好的結果。  long-term resistance scratch resistance test, i.e. after the scratch load repeatedly tested for residual gloss coating here also showed very good results for the coating compositions prepared in accordance with the present invention. 由在表5中给出的组分由此制备对比实施例V9至V12的清漆，合并在表5中给出的组分并搅拌直至产生均质混合物。  thus prepared from the components set forth in Table 5. Comparative Example homogeneous mixture V9 to V12 varnish combined components given in Table 5 and stirred until a embodiment. 类似于制备实施例I至4以及对比实施例Vl至V8的涂层，施涂、固化对比实施例V9至V12的涂层剂，并测试耐刮擦性以及防石击性质。 Preparation analogous to Example I to 4 and Comparative Example Vl to V8 embodiment of the coating, applying, coating agents curing Comparative Examples V9 to V12 embodiment, and tested for scratch resistance and an anti-stoning properties. 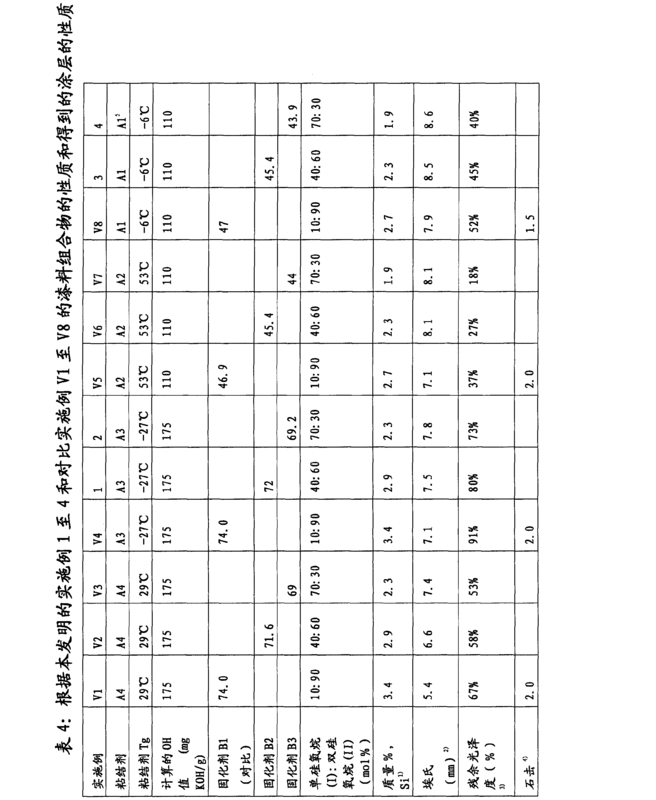 结果描述在表6中。 The results are described in Table 6. D =以质量％表示的理论计算的硅含量（相当于在热重分析中的预期硅含量）。  D = the theoretical silicon content in mass% calculated (corresponding to the silicon content expected thermogravimetric analysis). 其从所使用的原料由此计算，脱除所有在硅上连接的有机基团并且仅考虑一半的在硅上的氧原子。 Thereby calculating from the raw material which is used, removal of all organic groups and silicon-bonded on only half of the oxygen atom consideration on silicon. 对比实施例V9与对比实施例VlO的对比在这里也显示已经在表4的测试结果讨论时发现的效应，在相同的交联剂⑶和相同的粘结剂OH值的情况下，如对比实施例V9或者Vll中使用根据本发明的具有低于10°C的玻璃化转变温度的粘结剂时比如对比实施例VlO或者V12中使用具有高于10°C的玻璃化转变温度的粘结剂时达到了明显更高的耐刮擦性。  Comparative Example Comparative Example V9 and VlO embodiments herein comparative examples also show the effect has been found in the discussion of test results in Table 4, in the case of the same and the same crosslinking agent ⑶ OH value of binder, Comparative Example as comparative example V12 or VlO embodiment having the above glass transition temperature of 10 ° C when the Vll or V9 embodiment using a binder having a transition temperature in accordance with the present invention is less than 10 ° C in a glass It reaches the adhesive significantly higher scratch resistance. 但是同时这些对比实施例V9至V12说明，仅通过选择粘结剂不能到达足够的耐刮擦性，而这只有通过与根据本发明的交联剂（B)结合才能达到。  However, while these Comparative Examples V9 to V12 described embodiment, the binder can not be reached simply by selecting a sufficient scratch resistance, which can be achieved only through the binding (B) a crosslinking agent in accordance with the present invention. 但是最后在这里再次指出，在交联剂选择方面对本发明重要的还在于，不仅使用具有硅烷基团的交联剂，而且将交联剂用根据本发明的结构单元（I)和（II)的混合物改性；因为只有如此才能保证，良好耐刮擦性的同时还达到相应地良好的埃氏杯突值（对比表4的测试结果的讨论）。 Finally, but again here that, in the selection of the crosslinking agent is important is that the present invention, not only a crosslinking agent having silane groups, and crosslinking agent with a structure unit (I) of the present invention and (II) the mixture was modified; only so as to ensure good scratch resistance and also corresponding to achieve good Erichsen value (discussed in the comparative test results in table 4). 1.涂层剂，其含有(A)至少一种含羟基的聚丙烯酸酯和/或至少一种含羟基的聚甲基丙烯酸酯，和(B)至少一种含异氰酸酯基团的化合物，其具有至少一种式（I)的结构单元（I) -NR-(X-SiR" x(OR' ) 3-x) (I), 和具有至少一种式（II)的结构单元（II) -N(X-SiR" X(OR' )3-x)n(X/ -SiR" y(0R' )3-y)m (II) 其中， R =氢*、烧基、环烧基、芳基或芳烧基，其中碳链可以被不相邻的氧、硫或NRa基团插入，其中Ra =烷基、环烷基、芳基或芳烷基， R'=氢!、烧基或环烧基，其中碳链可以被不相邻的氧、硫或NRa基团插入,其中Ra =烧基、环烷基、芳基或芳烷基，优选R'=乙基和/或甲基， X、V =具有I至20个碳原子的直链和/或支链的亚烷基或亚环烷基，优选X、V =具有I至4个碳原子的亚烷基， R"=烧基、环烧基、芳基或芳烧基，其中碳链可以被不相邻的氧、硫或NRa基团插入，其中Ra =烷基、环烷基、芳基或芳烷 1. The coating agent containing (A) at least one hydroxyl-containing polyacrylate and / or at least one hydroxyl group-containing polymethacrylate, and at least one compound containing an isocyanate group (B), which having the structural unit (I) -NR- (X-SiR "x (OR ') 3-x) (I), and having at least one structural unit of formula (II), (II) at least one compound of formula (I), -N (X-SiR "X (OR ') 3-x) n (X / -SiR" y (0R') 3-y) m (II) wherein, R = hydrogen *, burn group, a cycloalkyl group burning, an aryl group or an aryl group burning, wherein the carbon chain may be interrupted by nonadjacent oxygen, sulfur or NRa groups inserted, where Ra = alkyl, cycloalkyl, aryl or aralkyl group, R '= hydrogen!, burn-yl burning or cyclic group, wherein the carbon chain may be interrupted by nonadjacent oxygen, sulfur or NRa groups inserted, where Ra = burn group, cycloalkyl group, aryl group or aralkyl, preferably R '= ethyl and / or a group, X, V = I having a linear to 20 carbon atoms and / or alkylene cycloalkyl alkylene or branched alkyl group, preferably X, V = I having to 4 carbon atoms, an alkylene group, R " = group burn, burn cycloalkyl group, an aryl group or an aryl group burning, wherein the carbon chain may be interrupted by nonadjacent oxygen, sulfur or NRa groups inserted, where Ra = alkyl, cycloalkyl, aryl or aralkyl group ，优选R"=烷基，尤其是具有I至6个C-原子的烷基， n = 0 至2， m = 0 至2, m+n = 2,以及x、y = 0 至2, 其特征在于， (i)作为组分（A)使用的含羟基的聚丙烯酸酯和/或含羟基的聚甲基丙烯酸酯具有低于10 °C的玻璃化转变温度， (ii)含异氰酸酯基团的化合物⑶具有多于10mol%至90mol%的至少一种式⑴的结构单元和10至少于90mol%的至少一种式（II)的结构单元，各自基于结构单元（I)和(II)的总和计，和(iii)使化合物（B)的二异氰酸酯和/或多异氰酸酯母体的10至60mol%的异氰酸酯基团反应生成式（I)和（II)的结构单元。 , Preferably R "= alkyl, in particular alkyl group having I to 6 C- atoms, n = 0 to 2, m = 0 to 2, m + n = 2, and x, y = 0 to 2, characterized in that the hydroxyl-containing polyacrylate (i) used as component (a) and / or a hydroxyl group-containing polymethacrylate having a glass transition temperature of minimum 10 ° C, (ii) containing isocyanate groups ⑶ compound having at least one structural unit of formula ⑴ more than 10mol% to 90mol% of the structural units and at least 10 to 90mol% of at least one of formula (II), the respective structural units (I) and (II), the sum, and (iii) the compound (B) is a diisocyanate and / or 10 to 60mol% isocyanate precursor isocyanate groups react and (II) structural units of formula (I). 2.根据权利要求I的涂层剂，其特征在于，作为组分（A)使用的含羟基的聚丙烯酸酯和/或含羟基的聚甲基丙烯酸酯具有_60°C至5°C，优选-30°C至<0°C的玻璃化转变温度Tg。 2. The coating composition according to claim I, wherein the hydroxyl group-containing polyacrylate (A) is used as a component and / or a hydroxyl group-containing polymethacrylate having _60 ° C to 5 ° C, preferably -30 ° C to <glass transition temperature at 0 ° C Tg. 3.根据权利要求I或2的涂层剂，其特征在于，含异氰酸酯基团的化合物（B)具有20至80mol % ,优选30至70mol %的至少一种式（I)的结构单元和80至20mol % ,优选70至30mol%的至少一种式（II)的结构单元，各自基于结构单元（I)和（II)的总和计。 3. The coating composition of claim I or 2, wherein the compound (B) containing isocyanate groups having 20 to 80mol%, preferably at least one structural unit of formula of 30 to 70mol% (I) and 80 to 20mol%, structural unit is preferably 70 to 30mol% of at least one compound of formula (II), the sum of the respective structural units (I) and (II) a. 4.根据权利要求I至3中任一项的涂层剂，其特征在于，所述涂层剂具有I. 5质量％至6.0质量％ Si的计算的硅含量，优选2.0质量％至5.0质量％ Si的计算的硅含量，各自基于所述涂层剂的固含量计。 I The coating agent according to claim 3, wherein the coating agent has I. 5 mass% to 6.0 mass% of Si calculated silicon content is preferably 2.0 mass% to 5.0 mass % Si calculated silicon content of, each based on the solids content of the coating composition. 5.根据权利要求I至4中任一项的涂层剂，其特征在于，用于制备含异氰酸酯基团的化合物（B)的二异氰酸酯和/或多异氰酸酯具有小于等于0°C的玻璃化转变温度。 According to claim I to the coating agent according to any of claims 4, characterized in that, for the compound (B) is prepared containing the isocyanate groups of a diisocyanate and / or polyisocyanate having less glass at 0 ° C transition temperature. 6.根据权利要求I至5中任一项的涂层剂，其特征在于，用于制备含异氰酸酯基团的化合物⑶的二异氰酸酯和/或多异氰酸酯是I，6-六亚甲基二异氰酸酯和/或其异氰脲酸酯三聚体和/或其脲基甲酸酯二聚体。 According to claim I to any one of the coating agent according to 5, characterized in that, for the diisocyanate compound prepared containing isocyanate groups ⑶ and / or polyisocyanate is I, 6- hexamethylene diisocyanate and / or the isocyanurate trimers and / or allophanate dimers. 7.根据权利要求I至6中任一项的涂层剂，其特征在于，通过如下方式制备含异氰酸酯基团的化合物（B):使二异氰酸酯和/或多异氰酸酯与至少一种式（Ia)的化合物H-NR-(X-SiR" X(OR' )3-x)(Ia), 和与至少一种式（IIa)的化合物HN(X-SiR" X(OR' )3-x)n(X/ -SiR" y(0R' )3-y)m (IIa)， 反应，其中取代基具有在权利要求I中列举的含义。 According to claim I to the coating agent according to any one of claims 6, wherein the compound (B) isocyanate groups prepared containing the following manner: that the diisocyanate and / or polyisocyanate with at least one compound of formula (Ia ) of compound H-NR- (X-SiR "X (OR ') 3-x) (Ia), and with at least one of formula (IIa) is a compound of HN (X-SiR" X (OR') 3-x ) n (X / -SiR "y (0R ') 3-y) m (IIa), the reaction, wherein the substituents have the meanings recited in claim I below. 8.根据权利要求I至7中任一项的涂层剂，其特征在于，所述涂层剂含有20至80重量％，优选30至70重量％的至少一种含羟基的聚丙烯酸酯（A)和/或至少一种含羟基的聚甲基丙烯酸酯（A)，各自基于涂层剂的固含量计。 According to any of claims I to 7, a coating agent, wherein the coating agent contains 20 to 80 wt%, preferably 30 to 70% by weight of at least one hydroxyl-containing polyacrylate ( a) and / or polymethyl methacrylate (a) containing at least one hydroxyl group, each count based on the solids content of the coating agent. 9.根据权利要求I至8中任一项的涂层剂，其特征在于，所述含羟基的聚丙烯酸酯和/或含羟基的聚甲基丙烯酸酯可通过使如下组分共聚而获得， (a) 10至80重量％，优选20至50重量％的丙烯酸的含羟基的酯，或者这些单体的混合物， 03)0至30重量％，优选0至15重量(％的不同于（a)的甲基丙烯酸的含羟基的酯，或者由这样的单体组成的混合物， (c) 5至90重量％，优选20至70重量％的不同于（a)和（b)的在醇残基中具有至少4个碳原子的（甲基）丙烯酸的脂族或环脂族酯，或者由这样的单体组成的混合物， (d)0至5重量％，优选0. 5至3. 5重量％的烯属不饱和羧酸或由烯属不饱和羧酸组成的混合物， (e) 0至50重量％，优选0至20重量％的乙烯基芳烃或由这样的单体组成的混合物，和(f)0至50重量，优选0至35重量％的不同于（a)、（b)、（c)、（d)和（e)的烯属不饱和单体，或者 9. The coating composition of claims I to any one of claims 8, wherein the hydroxyl group-containing polyacrylate and / or a hydroxyl group-containing polymethacrylates may be obtained by copolymerizing the following components, (a) 10 to 80 wt%, hydroxyl group-containing ester is preferably 20 to 50% by weight of acrylic acid, or mixtures of these monomers, 03) 0 to 30 wt%, preferably 0 to 15 wt. (% different from (a ) methacrylic acid esters containing a hydroxyl group, or a mixture composed of such monomers, (c) 5 to 90 wt%, preferably 20 to 70% by weight is different from (a) in an alcohol residue and (b), acrylic aliphatic or cycloaliphatic ester, or a mixture of such monomers consisting of (meth) group having at least 4 carbon atoms, (d) 0 to 5 wt%, preferably from 0.5 to 3.5 wt% of an ethylenically unsaturated carboxylic acid or mixture of carboxylic acids from ethylenically unsaturated component, (e) 0 to 50 wt%, preferably 0 to 20% by weight of a vinyl aromatic hydrocarbon or a mixture of such monomers, and (f) 0 to 50 wt, preferably 0 to 35% by weight is different from (a), (b), (c), (d) and (e) an ethylenically unsaturated monomer, or 这样的单体组成的混合物， 其中组分（a)、（b)、（c)、(d)、(e)和（f)的重量份之和始终为100重量％。 Mixtures of such monomers, wherein component (a), (b), (c), (d), (e) and (f) the sum of the parts by weight is always 100% by weight. 10.根据权利要求I至9中任一项的涂层剂，其特征在于，所述涂层剂含有至少一种含磷和含氮的催化剂。 According to claim I to 9 in the coating agent according to any one of, wherein the coating agent contains at least one catalyst containing phosphorus and nitrogen. 11.多步涂层方法，其特征在于，将颜料着色的底漆层施涂于任选预涂覆的基底上，并随后施涂由根据权利要求I至10中任一项的涂层剂构成的层。 11. The multi-step coating process, wherein the primer layer is applied to a pigmented optionally pre-coated substrate, and subsequently applied by the claims I to 10 in the coating agent according to any one of constituting layers. 12.根据权利要求11的多步涂层方法，其特征在于， 在涂覆颜料着色的底漆层后，首先将所施涂的底漆在室温至80°C的温度下干燥，和在涂覆根据权利要求I至10中任一项的涂层剂之后，在30至200°C的温度下在一分钟直到10小时的时间期间固化。 12. The multi-step method of coating according to claim 11, wherein, after the primer layer is coated colored pigment is first applied to the primer to dryness at room temperature to 80 ° C, and a coating after coating according to claim I to any one of the coating agent 10, at a temperature of 30 to 200 ° C to cure during one minute up to 10 hours. 13.根据权利要求I至10中任一项的涂层剂作为清漆的用途或者根据权利要求11或12的方法用于汽车系列涂漆、汽车部件的涂漆和汽车修补涂漆的用途。 13. The coating composition as claimed in claims I to 10 for use as any one or varnish 11 or claim 12 for automotive OEM finishing and automotive paints, automotive parts lacquered repair purposes. 14.由至少一层颜料着色的底漆层和至少一层设置在其上的清漆层组成的赋予效果和/或赋予色彩的多层涂漆，其特征在于，所述清漆层由根据权利要求I至10中任一项的涂层剂制备。 14. A primer layer and at least one layer provided on at least its effect imparting layers composed of a varnish and / or paint systems pigmented color layer, wherein said varnish layer by the claims preparation of coating agent of any one of I to 10. MX2015006008A (en) 2012-12-03 2015-09-10 Basf Coatings Gmbh Coating material compositions and coatings produced therefrom with high scratch resistance and good polishability and good optical properties, and use thereof. ES2316066T3 (en) 2005-03-11 2009-04-01 The Sherwin-Williams Company Scratchproof composition curable coating.